COLORFUL - The dashing underside of the XP-17 wing (with white on top, allowing the light through) mates well with the Air Création brand-identifying red chassis and floats. LOADED PANEL - Seaplanes are often sparsely equipped with instruments - most flying is done near the deck while referring to visual references. But Silvain's GTE floatplane with an XP-17 wing uses the stock GTE 7-instrument console (intercom to left, key start to right, radio on the T-panel). PROTECTED PROP - This front-end view shows the sleek float system which comes with the fabric water spray protector for the prop. Given the high value of a 4-blade prop, this is a worthy addition. You might like the way it looks, too. SERIOUSLY ENGINEERED - Air Création is one of the world's largest aircraft builders with 2,500 trikes flying. Designers make wide use of customized parts and all are beautifully finished. COMFORTABLE CABIN - Though the GTE is wide open, these well-padded seats and a secure helmet will make cross-country flights pleasurable. Note the nicely housed throttle near the pilot's right hip. CANADIAN REP - Silvain Boucher smiles back from the captain's seat of his GTE XP-17 floatplane. Though the GTE has a small windscreen, Silvain prefers a helmet with full-face protection. WATER RUDDERS - I know from personal experience that trikes without water rudders are nearly impossible to maneuver in the water; you don't have a tail in prop blast to help. Like most, these rudders retract for beaching. 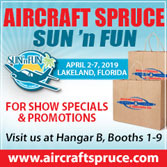 WATER FRIENDLY - With very little draft and no tail to consider, maneuvering in a trike is as easy at a seaplane base as on a crowded airport ramp. Note the handy control bar tie-downs attached at each corner. Air Création is a serious company and a world-class trike builder with an impressive sales record. Their serious trikes sport beautiful hardware and numerous customized components. Right down to their trademark red color, Air Création is serious about building a remarkable trike, a series of them in fact. So when Air Création puts a float set on the market, you can count on the fact that it was well researched and exquisitely crafted. Now, let's combine that with the XP-17 wing, the largest in the company's XP series. Floats are mounted under and the wing atop a GTE trike carriage which has been in production for several years. Put this all on a lake in Florida and you have the makings of an interesting experience. Another 20-Year Veteran Gilles Bru and Jean Yves le Bihan founded the French company in 1982. Air Création's dealer in Canada reports, "It has grown steadily ever since, building around 4,000 wings and 2,500 trike-units for sale in more than 50 countries." Today Air Créationemploys 25 people, four of whom are in the technical department designing new products, and 14 work on the production of ultralight trikes and wings.With annual sales of about $2.5 million, Air Création exports 60% of its products. 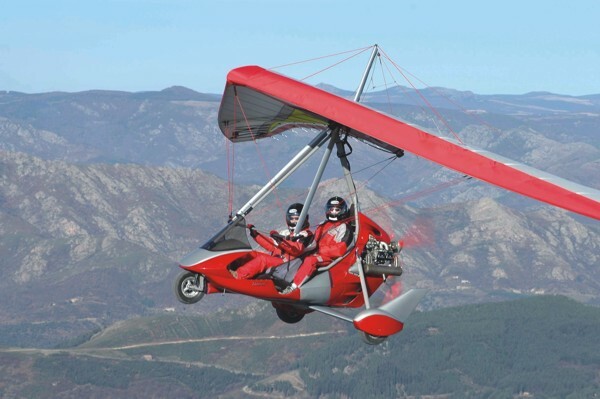 Based in southern France, the ultralight builder offers three trike models: the Racer, a single-seat design powered by a 40-hp Rotax 447 or 50-hp Rotax 503 engine; the 2-seat GTE shown in the accompanying photos, or as a variant called the Buggy (evaluated in the May '01 issue of Ultralight Flying! magazine) usually equipped with a 65-hp Rotax 582; and their top-of-the-range Clipper, which is offered with the Rotax 582 and 81-hp Rotax 912 engines. Air Création also offers a variety of wings, including the Fun 18 single-surface wing (best used with the Racer trike), the entire XP series of four sizes, and the newest Kiss wing in two sizes. As with all trikes, it is the wing that dictates the lifting capacity of the ultralight, not the carriage or whatever engine is strapped to it. To their credit, Air Création has long made it very clear that their wings are to carry only a placarded amount. The big XP-17 wing can do the job of lifting the GTE/582, two occupants, and the float system. In fact, the larger wing is valuable to assure enough square footage to get the floats and aircraft out of the water. The Air Création floats were seven years in development. "They sunk a number of them," U.S. representative Rob Albright says. To me, they appeared very stoutly constructed; indeed, our test floats have reportedly seen 10 years of duty yet looked nearly new. Air Création's floats are made from low-density foam contained in a fiberglass epoxy envelope, which Air Création calls "unsinkable." After logging thousands of hours of float operation, designers feel they have perfected the floats and hardware assembly. The float option includes antioxidation treatment for all steel parts on the trike as well as a special treatment for the exhaust system, which is additional justification for the rather high price tag they assign to the float package. For more detailed information as to which carriage and wing combinations you can use, contact Air Création USA. Well-Integrated Design The GTE can be adjusted for center-of-gravity attachment while on the ground without having to disconnect the wing. However, I wouldn't call this change "quick and easy." An inch forward or aft on the carriage-to-wing connection makes a noticeable difference in pilot muscular effort. This is not an in-flight trim system - which you can have on some Air Création trikes - but similar to ground-adjustable pitch on a propeller. You may skip the ground adjustment but you'll experience a slightly out-of-trim feel in pitch. That is, you may have to push out or pull in at all times for some speed settings. Such effort is easily achieved, though on longer flights it may prove tiring. The seating arrangement is innovative in that the rear seat can be reconfigured for solo use. After a few quick changes with the seat belts and the attachment of a backrest plate (via a couple of small delrin-type clamps), the front seat has good back support. Of course, with someone seated in the back, the front pilot has back support without this reconfiguration although you are sitting right up against your rear- seat occupant. The earlier GT-BI model that preceded the modern GTE had no windscreen. While the windscreen on the float-equipped GTE blessed the chassis with nicer lines, it still didn't do much for reducing windblast. At the speeds this ultralight can fly (80+ mph), you'll want a helmet with good face protection, such as the one worn by my check pilot Silvain Boucher, shown in the photos. If you examine the GTE chassis carefully, you'll observe many nice finish details: a plastic box around the throttle handle which hides its workings, the leather protectors around the control bar ends, the friction tape on the control bar, and a beautifully shaped and functional fiberglass instrument pod. Cockpit entry and exit are as straightforward as you'd expect. The procedure calls for you to start by putting your foot on the main front-to-rear structural member, often called a "keel." Next place your hand on the forward support tube. Finally, step into the back seat by putting your feet on the rear seat pegs and lowering your bottom. Air Création advocates boarding the aircraft from the left-hand side of the trike, being careful not to move the throttle control on the right-hand side of the aircraft. The throttle isn't delicate; the purpose of this advice is to keep from inadvertently advancing the throttle prior to start-up. Aircraft of all descriptions have caused damage when an engine roars to life more powerfully than expected. Air Création locates the control bar basetube higher than many other trike brands, however, this may account for some difference in flying qualities. Another description is to say the control bar isn't higher; rather, the pilot (and trike carriage) are lower. In weight-shift aircraft with pendulum stability a lower position of trike and pilot equates to finer control. If the weight-shifting mass is farther below the wing, the movements of the control bar are physically easier and the resultant response to a control bar movement will be less. Put another way, the control pressures are lighter but your range of movement is smaller. Air Création's control bar is about chin high (depending on pilot size, of course), and your arms must reach up slightly to grasp it. Some trike brands have the control bar basetube at stomach height and your arms are lowered to hold the bar. You might think of this as merely a personal matter but some control difference is certain. Air Création says, "The wing geometry of this new generation of flex-wings gives tremendous stability in the air and on the ground from having the center of gravity set well below the raised thrust line." GTE on H 2 O The GTE's throttle system is excellent; you can use either foot or hand for power adjustments. Trike experts recommend the foot throttle for takeoff and landing as you need both hands on the control bar. Once at altitude, you can shift to the right-side hand throttle. The throttle override linkage works beautifully. Whichever control is advanced the most is the dominant one. Once well clear of the pattern, you can hold the control bar with your left hand and move the hand throttle till you feel resistance. Afterward, you can relax your foot; the throttle will stay put nicely. On water, the procedure is the same as on land - full power to accelerate and clear the surface. Once aloft, you can switch to the hand throttle for cruising or stay with the foot throttle if you wish to perform a series of takeoffs and landings, as I did. The trickier part is float handling. For comparison, when I flew the Krücker Amphib earlier in the day, I added full power and pushed out on the bar liberally. Within a short time, the Krücker left the water and I relaxed the push-out effort. This is common trike technique, good in most situations. It was inappropriate on the GTE float trike. With these floats, you can push out liberally, but you may want to moderate the effort before leaving the water. However, takeoffs are fairly easy to figure. It was the landing that forced more attention to the task. When approaching the water in the GTE float trike, you maintain the same approximate level attitude you do in most floatplanes. However, on reaching the water, I found the experience closer to my work in a Cessna 172 on floats rather than the majority of ultralights. I found, with advice from Silvain in the rear seat, that it's best to ease into the water. While Air Création's floats have superb flotation and while they don't inhibit cross-country flying like some float ultralights, they are not as tolerant of pitching motions while on the water. I'm not sure that you could stuff the nose of the floats by incorrect controls, but it felt like you could. Silvain seemed apprehensive of my experiments, and once had to advise of landings that were either rather firm or tended to porpoise. After flying a good number of floatplanes, I found the Air Création floats demanded more technique than most others. It was a world apart from the Krücker experience that day. On my first landing I came in too fast, held a fixed attitude (that is, no flare), and touched down too fast. This caused some porpoising that took deliberate effort to cease. I bounced back up and grappled with the control somewhat. However, I hasten to add that a "silver lining" comes with the Air Création floats. The overall package is one better suited to distance flying than most ultralights on floats. With the GTE/582 carriage, and the big but tightly stretched XP-17 wing combined with the sleek floats, the trike can still manage speeds into the 80-mph range. For comparison, the Krücker floats with the big Butterfly wing from GibboGear couldn't easily maintain 50 mph for an extended flight. The Krücker floats were far easier on the water operations but you wouldn't want to fly too far. On the other hand, the Air Création float trike could carry you comfortably to a seaplane fly-in some 200 miles away. And you'd get there before the party was over. 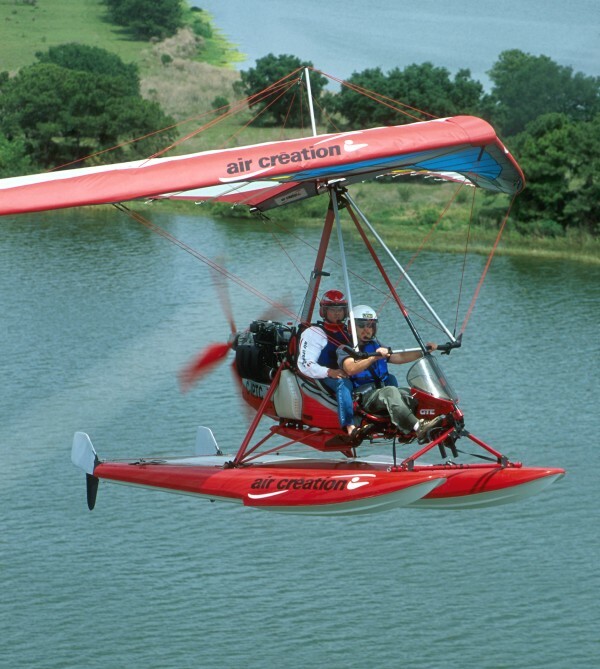 Albright says most basic trike or ultralight floatplanes tend to be trailered to the fly-ins. With a bit of practice, say 20 to 30 takeoffs and landings in varying conditions and lake sizes, the Air Création floats would easily become favorites. They work excellently; you simply must respect their performance edge. I also liked the way the kill switch is buried within a U-shaped bracket, to prevent inadvertent shutdown. Europeans tend to such hardware detail more than many American designs. On a floatplane, killing the engine is normal as you approach a docking or beaching situation. Good access is desirable, but I liked the hooded switch at all other times. Not only do the Air Création floats perform admirably, the GTE/582 trike with the big XP-17 wing handles better than I expected. It was a day of some surprises. Big XP Wing My earlier experience with Air Création's XP wing series had me expecting a flight that might resemble a Nautilus machine workout. However, I was pleased, even delighted, with the control characteristics of the XP-17 wing. Having flown Air Création's XP-11, XP-12 and XP-15 wings, as well as two of their newer Kiss wings, my preference leans heavily toward the smaller wings, which I find highly satisfactory. It took far too much work to fly the XP-15 in my opinion, though other pilots feel differently. Albright is one such person. He prefers the way the XP wings will hold a final approach line more easily than a more responsive wing that has to be flown all the way to roll-out. This is a statement understood by many trike pilots of comparable wings. Smaller, more frequent control actions mean you are deflecting the trike carriage less, which works out well for precise flying unless you need sudden movement in another direction. The stiff wing in concert with the heavy trike carriage poses a challenge. So, if I didn't care for the XP-15 wing - certainly when compared to their newer, easier handling Kiss wing series - then you'd think that the XP-17 wing would be even less desirable. In fact, I turned down a chance to fly the XP-17 with a 81-hp Rotax 912 on a Clipper when I first saw it. I truly believed it would be too heavy-handling to suit my personal interest. Despite my misgivings, I found the GTE/582 with an XP-17 wing handled surprisingly well, possibly because I'd convinced myself it would be a more difficult experience. Perhaps the added weight of the floats actually helped. Pendular stability - a leveling characteristic foreign to most 3-axis pilots - is quite significant. The lower a greater amount of weight hangs from the wing of a trike, the more stable it will be, generally speaking. This is one reason why added weight can increase roll pressures. A counteracting factor is the weight that your arms must displace to effect control in any axis. That said, more weight suspended from a pendulum joint can, to some extent, make handling more efficient, if you have foresight in your approach planning and finesse in your control efforts. Albright spoke of flying 300 miles to another lake, stating that doing so in the XP-17 wing would be much easier than the Krücker. 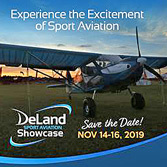 Many of those pilots will trailer their amphibian to a splash-in where the Air Création is more likely to be flown to the event, Albright maintains. "Easier" is a relative word, and it means different things to different people in different situations. The maximum speed I saw at liberal power and liberal pull-in was about 140 kilometers an hour. The instruments on Silvain's GTE were set up with a mixture of metric and English measurements: altitude in feet, speed in kilometers per hour; water temperature in centigrade, EGT/CHT in Fahrenheit. At 140 kilometers an hour, we were flying 88 mph, pretty darn fast in an open-cockpit trike with a big wing and large floats - an impressive performance, I felt. Air Création would also like you to know that one of their trikes holds the world altitude record for a microlight at 32,000 feet set by Serge Zin in September 1994 near Lyon, France using a GTE chassis with a Rotax 582 and the XP-15 wing. And they claim ownership of world records for time-to-climb to a height of about 10,000 feet (in just 5 minutes 40 seconds), and time-to-climb to a height of about 20,000 feet (in only 14 minutes 54 seconds) set by Roland Coddens with a Racer trike and their speedy XP-11 wing (my personal favorite of the XP series). Breathe Easy Over their 21 years of building trikes, Air Création has perfected the art to a high level. Go aloft in one and you'll quickly see this is a high-quality product that has been extensively engineered, and passes demanding certification schemes like a champion. The company is careful about many details. Air Création advocates boarding the aircraft from the left-hand side of the trike, being careful not to disturb the throttle control on the right-hand side of the aircraft. Being careful about this keeps the trike from getting away from you during start-up, especially if you are pull-starting from outside the seat. For a decade or so, Air Création has offered recoil-type shoulder belt systems that integrate with the normal lap belt. They were one of the first companies to add this feature; many trike-makers still provide only lap belts that have proved insufficient in violent upsets. The GTE's belts are anchored to the main upright support tube (behind the rear occupant). As I always do, I ran through a series of longitudinal stability checks by pulling or pushing the controls and then releasing. On the noseover (pull aft), I noticed the nose came up rather sluggishly although the speed accumulation was not particularly fast during this maneuver. Undesirable speed buildup is usually the problem associated with this tendency, but the trike design's inherent pitch stability - heavily due to the powerful pendulum force - keeps this from being a problem. Contrarily nose- up (push forward) movement resulted in a proper and normal response. The GTE/582 with the XP-17 wing bobbed back and forth only a few times and then stayed relatively level. Power-off stalls in the heavily loaded but large-winged GTE float trike came at about 35 to 40 mph, according to the installed ASI. A power-off stall, with mild movement of the bar, produced no real break, returning quickly to horizontal and revealing good stall characteristics. Repeating stalls with a very brisk motion, pushing all the way out to the support tube (equivalent to a joystick pulled fully back), the GTE and XP-17 did break. However, recovery was normal and fast. When I further aggravated the stall by keeping the bar full forward, it recovered anyway, on its own and in a short amount of time. Air Création is the only manufacturer to have carried out in-flight tests of the BRS rocket parachute system. On many machines made by the French builder, the activating handle is coupled to an ignition interrupter, which automatically cuts out the engine and the propeller to ensure that the parachute is successfully launched and the aircraft descends in a horizontal position. Air Création has worked quite deeply with BRS to perfect the mount of the parachute systems on their trikes. Buying Your Trike Floatplane The GTE/582 with XP-17 wing isn't your lowest cost choice. A well-equipped Air Création trike on floats is going to run around $30,000. This includes $14,580 for the GTE/582/4-blade trike chassis, plus $5,947 for the big wing, plus $8,500 for the entire float system. The entire package weighs 523 pounds (306-pound chassis less nosewheel, 117-pound wing, 100-pound float system). You can buy some float ultralights for less than $20,000 though they may not compare well to Air Création's float-equipped trikes. Yet it isn't hard to bid up the price even further. To their extra credit, the Air Création entry comes well-equipped and you may not want more than the basic gear. However, some options might tempt you. All Air Création wings are delivered standard with white UV-stop - and very durable - Trilam sailcloth on the upper surface. More conventional fabrics are used for red leading edge accents, red front lower surface, white rear lower surface, and a red keel pocket. Customers may choose different colors for each part of the wing as an option, although the upper surface is manufactured only in white. If you want to have your trike wing color personalized, you can have a wide variety, thanks to Air Création's computerized sailcloth-cutting equipment. This allows buyers to create their own patterns on the lower wing surface. The shape, size and colors of the panels may be chosen within certain limits of symmetry and cut. Air Création USA can advise further on this. Think of it as a custom paint job, except you don't need to add the weight of paint and someone else - an expert sailmaker - does the work. Although the French company uses a name that won't necessarily relate to American pilots, one option I recommend if you plan to do much cross-country flying is the "Pack Vmax. "This option is only available for the XP wings and includes a pitch trim system. It also includes slip-on fairings on the control bar downtubes and the kingpost to reduce drag at higher speeds. Air Création's trim system is simple, lightweight and is operated by altering the tension on the luff lines on the wing. Like any trim device, the control-wheel-adjusted system relieves pilot effort to hold the control bar in one position. If you know any hang glider pilots, you might find a ready group willing to pay your fuel expenses and perhaps buy you dinner at the end of the day if you will tow them aloft. One option Air Création offers, available on their S and SL models, is a tow release system. Using a hollow shaft C-type reduction drive, pull forces are directly through the center of thrust. Such a system allows controlled pulling of streamers, advertising banners, and hang gliders though you'll need permission for hang glider towing and can only do the other operations in countries that allow commercial operation in ultralights. The USA is not one of these at present, though such functions may be permitted by a Special Light-Sport Aircraft, if that rule passes as presently envisioned. Finally, if you're planning instruction in your Air Création trike, on or off floats, you may want the dual controls option. This allows full control of the trike from the rear seat. The instructor can override the steering and foot throttle at any time, leaving both hands free for controlling the airframe. (This option is not available on the Buggy model.) Warm spring and summer days make that bright red Air Création GTE on floats look mighty fine. I suggest you hitch a ride whenever possible. Bring your checkbook with you. Standard Features Rotax 582, ASI, altimeter, water temp, tachometer, side pouches, padded and adjustable seats, ground-adjustable trim, combo foot/hand throttle, remote choke, shock-absorbing gear, steerable water rudders, prop spray guard, mechanical brakes (land versions), presewn Dacron sail wing, 10-gallon fuel tank. Options Engines up to 81-hp Rotax 912, prop selections, electric starter, noise reduction system, additional instruments, towing package with hollow prop shaft, recoil shoulder belts, dual control set for instructors, ballistic parachute with factory-supplied engine cut-off system. Construction Aluminum airframe, fiberglass fairing, Dacron and hybrid fabric wing. Made in France (company partly U.S.-owned); distributed by U.S.-owned company. 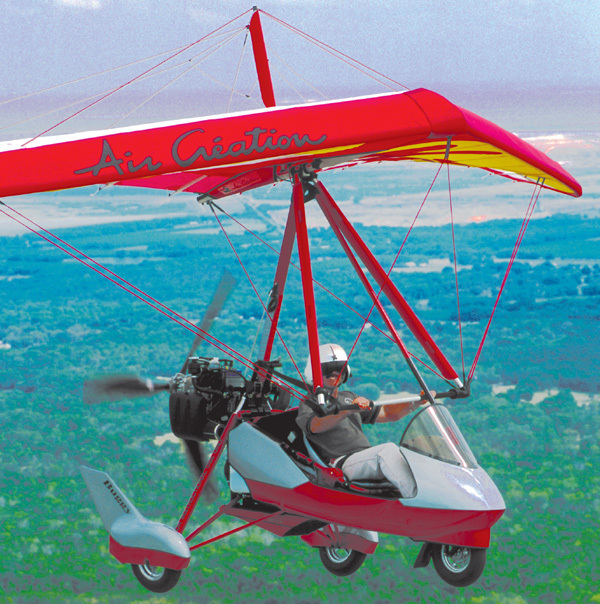 Pros - One of the world's largest aircraft producers, Air Création trike ultralights are found all over the world. Beautifully executed with many customized features. The XP-17 wing is from a well-evolved design family (of four models); works well for lifting floats. Various European certifications earned. Cons - Trike resale limited to those willing to learn weight-shift flying. Though Air Création has good American support, some buyers fear long wait for parts and services. Pros - Float system was carefully worked out over many years. Ground adjustable center of gravity and in-flight trim are options with some wings. Versatile throttle controls including rear foot throttle if desired (rarely seen). Kill switch well-protected against inadvertent shutdown. Check remaining fuel by leaning to the side. Cons - No trikes have flaps (yet) so approaches require extra planning; glide path control is limited. No in-flight trim on evaluation aircraft (though pitch pressures are modest, even for a very large wing). New techniques are needed to manage float systems (but all can be done after water landing). Pros - Easy entry and exit. Seats can be configured for backrest when flying solo. Well-padded seating with shoulder belts fitted to test ultralight. Excellent instrument panel; good space and readability. European silenced engines are amazingly quiet (though wind noise is of course significant). Side carry bags. Cons - Tandem seating - used on virtually every trike - isn't always preferred for instruction. Floatplane version lacks the slick body fairing available on other Air Création brands. Nonadjustable seats. Seats place occupants in close proximity - some brands now use fiberglass shells that separate better. Pros - Ground/water handling is excellent in crowded ramp or seaplane base situations. Water rudders were reasonably effective for slow-speed maneuvering. Floats appear to have exceptional capacity. Water spray guard protects expensive props during takeoff or landing operations. Cons - Common push right/go left trike steering is still odd to many conventionally trained pilots. Floats on trikes introduce new challenges - they don't immediately swing into the wind like a weathervaning tailed aircraft (though going downwind may be easier than in 3-axis aircraft). Pros - Ease of takeoff and landing is an endearing trike quality. Water landings, though requiring technique, are easy in large areas and onto a relatively smooth surface. You can easily bleed off speed on the water - pushing full-out helps slow you even faster (once appropriate). Cons - No flaps and no ability to perform slips limit the trike's short-field ability (though hardly a problem in water landings). Crosswind landings in trikes require practice (no factor on open water). Pros - For a very large, very taut wing, the XP-17 handled agreeably with the weight of the float system so far below the wing. No adverse yaw. Trikes coordinate quite naturally (with a bit of push-out in turns). Pitch pressures are modest and reassuring once deflected beyond normal. Overall, highly predictable. Cons - Roll was better than expected from a big, stiff wing though still more difficult than virtually any 3-axis; weight of floats adds to total muscular effort required. You'll need advice and time to practice crosswind controlling (though this may not be a factor on open water). Pros - Though water operations take extra learning, Air Création's float trike can cruise briskly, moreso than most float trike designs. Glide and sink are competitive, thanks partly to the large wing area of the XP-17. Excellent engine installation; low vibration and noise. Cons - Fast trike speeds without much of a windscreen means lots of windblast. Endurance is less than other big-engined ultralights due to the large floats. Climb suffers a bit with the extra weight of the floats. Flying low over water is fun, but this machine is less optimal low over fields due to speeds and control response. Pros - Stall response was excellent in all tests. Even when aggravated, the GTE/XP-17 was quick to recover virtually without input. Adverse yaw was nonexistent (as in many trikes). Very stable in turns; little push-out (stick back) needed. Throttle response was good, thanks to higher thrust line relative to mass. Cons - The noseover longitudinal stability check showed rather sluggish return to level (though speed buildup was unthreatening). Like all trike wings, you can overbank and tighten turns steeply. Pros - The GTE/XP-17/float combination makes a deluxe ultralight, enough to inspire real pride of ownership. Air Création passed several European certifications. Built ready-to-fly (though a kit is available). Two-seaters can fly under the Part 103 training exemption. Air Création designs their own wings and sell them to others. Cons - You'll spend more on European-built aircraft in 2003 (due to exchange rates, which can significantly affect cost). Resale may be slower because you'll have to find buyers who accept weight-shift control. Foreign-made, though U.S. customer support is well proven via Air Création USA - which also owns a share of the French company. Air Création is a serious company and a world-class trike builder with an impressive sales record. Their serious trikes sport beautiful hardware and numerous customized components. Right down to their trademark red color, Air Création is serious about building a remarkable trike, a series of them in fact. So when Air Création puts a float set on the market, you can count on the fact that it was well researched and exquisitely crafted. Now, let’s combine that with the XP-17 wing, the largest in the company’s XP series. Floats are mounted under and the wing atop a GTE trike carriage which has been in production for several years. Put this all on a lake in Florida and you have the makings of an interesting experience. Another 20-Year Veteran Gilles Bru and Jean Yves le Bihan founded the French company in 1982. Air Création’s dealer in Canada reports, “It has grown steadily ever since, building around 4,000 wings and 2,500 trike-units for sale in more than 50 countries.” Today Air Créationemploys 25 people, four of whom are in the technical department designing new products, and 14 work on the production of ultralight trikes and wings.With annual sales of about $2.5 million, Air Création exports 60% of its products. Air Creation's new TanarG lowers the trike's overall c.g., and stability is increased due to arack-and-pinion nosewheel steering. Air Creation's trademark red-and-gray color scheme helps illustrate the TanarG's resemblance to the company's other models but the difference is in the details. Folding down the TanarG will be a whole new and better experience for owners who want to do it solo. The fulcrum is now much farther forward than on older models. Formerly, the structure of all Air Creation trikes was built of aluminum. Now, a weldment does the job, offering a new look. On the horizon Air Creation's new TanarG is a high-end, high-energy alternative. Thanks to aviation pioneers in France, Americans use terms such as empennage, aileron and fuselage. For 2005, we can learn a new French word: TanarG. This is the name of a new aircraft from Air Creation, the world's largest trike builder. And based on a first review, this is the slickest rig from the company to date. At first glance, the TanarG Air Recreational Vehicle (it's a trike) may appear like the company's Clipper model, but look more carefully. This new chassis has so many changes that up close, it bears little resemblance to earlier models. What's In a Name? When I first heard from John Kemmeries of Air Creation USA, he said that the term tanarg "is an ancient word meaning a strong natural force, such as a tsunami." Given last January's earthquake in the Indian Ocean and the subsequent disaster, tsunami takes on new meaning. Air Creation's Jean-Luc Tilloy expanded on the definition: "Apparently it is more specific than just a strong natural force. We understand tanarg refers to thunder. The origin of the word is very old-how old we don't know. It is not found in any modern language we can find." Tanarg is also the name of a mountain near the Air Creation factory. The French say a monument at the base of the mountain refers to thunder but gives no information as to the origin or exact meaning of the word. "We feel that if we spell it TanarG, with the emphasis on the G (like 'energy'), it will be easier for the American tongue." I like it better than TanaRG, the company's original Americanization, which suggested retractable gear. An Airborne Motorcycle The TanarG's new body fairing incorporates elements of the modern breed of high-speed motorcycles often referred to as crotch rockets, which help lend a dynamic appearance to the machine. According to Kemmeries, "The TanarG brings the highly developed innovations of the motorcycle, ATV, jet ski and automotive industries to bear with the same clear focus Air Creation applies to safe, practical, maintainable performance and handling." Like the Honda Gold Wing motorcycle, this is a deluxe trike. "The only nonstandard OEM options are towing [linkages] and dual control for instructional use," Kemmeries says. 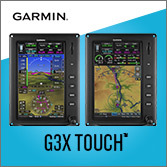 Aftermarket options include an emergency parachute plus radio and instruments. In addition, Air Creation USA's custom shop can add anything on a time-and-materials basis, including position lights, Mode C, GPS and more. But the TanarG is not for those on a limited budget-it retails for $52,750 (at current dollar/Euro exchange rates) with a Rotax 912 and the top-of-theline iXess wing. "Our current 912-powered rig is about $10,000 less," Kemmeries says. "We will continue with the GTE and Clipper 912 models to remain viable to a larger demographic." The company also sells a modestly priced Fun Racer. The TanarG can be fitted with the Fun 450 wing (slow), the Kiss 450 wing (medium), or the iXess wing (fast). I've flown all of these wings and each has something to be said for it but I would recommend either the Kiss for its sweet handling or the iXess for excellent all-around performance and handling. The latter is most valuable for cross-country flights; it is quite speedy. "The TanarG utilizes adjust-able rack-and-pinion steering, allowing the pilot to be seated behind the front wheel as op-posed to over it," Kemmeries says. Such an arrangement helps to significantly lower the aircraft c.g. When coupled with all-wheel hydraulic disk brakes and large-footprint tires on a longer wheelbase, the TanarG provides the stability, handling and driving performance found in rally race carts. Since steering is adjustable, the TanarG can accommodate persons ranging in size from 5-foot-5 to 6-foot 10. "All points of pressure on the occupant have been eliminated," Kemmeries said. "Wide seats and full back support provide lounge comfort for any waistline." Easy setup and handling is engineered into the new geometry, which represents a radical departure for Air Creation. The mast connecting wing to chassis now hinges on a structure pivoting near the fore/aft center of mass so that one person can more easily do a solo setup. With good speed, a highly reliable four-stroke engine, easy flight characteristics, plenty of occupant comfort, and space for gear and supplies, "TanarG is the ultimate touring machine," Kemmeries says. Coming to America The TanarG is coming soon. "We will have the first TanarGs in Arizona in late March and will show them at Sun 'n Fun 2005," Kemmeries said. "It appears that the price will not discourage the well-to-do buyer, as the first batch has already sold." To date, Air Creation USA has ordered 20 units for 2005, and the company is hoping to double that. But demand is high in other countries, so Kemmeries doesn't know if he will get many more than 25 units. "We may sell out this spring," he said. Air Creation has been working on a new factory in China to help keep up with demand. "China is up and running, producing the current GTE, Clipper and XP models," Kemmeries said, "but this won't help the U.S. market until the initial Asian order is completed." Meanwhile, Air Creation USA will be out in force promoting the company's entire line of colorful trikes. "We will be sending a team on a marketing tour this summer to fly to events and shows around the country with a TanarG 912 and a GTE 912, both fitted with the iXess wing," Kemmeries said. The tour starts in June. If you're a potential high-end trike consumer, don't miss the chance to check out this sleek new machine. J For more information: Contact Air Creation USA/Kemmeries Aviation at www. aircreation.net or call 623/566-8068. To review all "Light Stuff" columns that have appeared in KITPLANES®, visit www.ByDanJohnson.com, which links to the KITPLANES® website with articles of interest. On the horizon Air Creation’s new TanarG is a high-end, high-energy alternative. Thanks to aviation pioneers in France, Americans use terms such as empennage, aileron and fuselage. For 2005, we can learn a new French word: TanarG. This is the name of a new aircraft from Air Creation, the world’s largest trike builder. And based on a first review, this is the slickest rig from the company to date. At first glance, the TanarG Air Recreational Vehicle (it’s a trike) may appear like the company’s Clipper model, but look more carefully. This new chassis has so many changes that up close, it bears little resemblance to earlier models. What’s In a Name? When I first heard from John Kemmeries of Air Creation USA, he said that the term tanarg “is an ancient word meaning a strong natural force, such as a tsunami.” Given last January’s earthquake in the Indian Ocean and the subsequent disaster, tsunami takes on new meaning. SLEEK BODY - Look at any modern high-end motorcycle and compare it to this lovely shape; the trike comes out a winner though it probably won't go as fast. COCKPIT INTERIOR - Tastefully color-coordinated in Air Création's trademark red and silver, the Buggy's interior is also complete with instruments, sturdy pedals, nosewheel fender, and a tiny but useful windscreen. SECURELY BELTED - Unfortunately the shoulder belts are an option. Fortunately, they're well done, comfortable, and spring-loaded so the extra fee is probably worth it. CARGO POD - The Buggy was always intended as a 1 + 1 that preferably seats one but can carry two. When flown solo, the rear seat does a neat trick by turning into this cargo area, which doubles as a backrest. MODERN MACHINE - Combine this brilliant new wing with the beautiful design and detailing of the Buggy chassis and you have one of the top trikes made in any country. THROTTLE & SWITCHES - On the pilot's right is this clearly marked throttle. The underside of the quadrant has the kill switch (rear) and mag switch (front), both protected from inadvertent operation. FRIENDLY FRENCHMEN - Gilles Bru (front) and Jean-Luc Tilloy have been coming to U.S. airshows for years. Both men are very knowledgeable and speak excellent English to inquiring Americans. DUAL CONTROLS - Near the fairing floor you see the rear seat steering bar that gives an instructor control. What's unusual is the foot throttle for the instructor; most trikes lack this feature. INVISIBLE RADIATOR - Air Création has long since worked out this clean radiator installation for the Rotax 582. This is about as out-of-the-way as it gets. For many years, I've been critical of trike handling. While I try never to forecast the future, I've gone out on a limb and predicted that rigid-wings will eventually become commonplace on trikes (though I don't also predict delta wings will disappear). Going Rigid? Rigid-wings look a lot like modern hang gliders and trike wings in many ways, but they have control surfaces. Because these surfaces are deployed via weight-shift movements they neatly combine the benefits of 3-axis ultralights - lower control forces and good control authority - with the elegant simplicity of weight-shift. Rigid-wings can carry good weight and are somewhat faster than delta wings (called "flex wings" by hang glider pilots), and they also handle more easily. I think this makes them a nearly inevitable development. While I still believe rigid-wings are coming to trikes, it may take longer than I thought because the trike industry may finally be rising to the challenge. Air Création's Kiss wing is a case in point. Heavier 2-place trikes with big engines are often a workout to fly. Their handling requires a special finesse to produce precision turns. Abrupt maneuvering - that sort of darting about that is so much fun in ultralights - requires significant use of muscle on most big trikes. Frankly, I don't care for it. I like trikes. I'm a trike owner. But mine is a sweet-handling single-place trike with a fairly high wing loading. I'm not trading it for a big trike, but I will happily announce that the Air Création Kiss wing is one of the best things to hit the larger trike market in a long time. I must be fair to two other companies. The new AirBorne Streak wing is also very good, a wonderful advancement over their earlier wings. And North Wing Design has long offered nice-handling wings, though this was sometimes achieved with single-surface wings that are better in handling actions regardless of brand. Yet I can and will take nothing away from Air Création's Kiss. I love this wing! If you're buying Air Création, my advice is to go out of your way to get a Kiss wing. Tricks of the Trade How did Air Création find such improvement? The truth is, they won't divulge all their tricks. Other manufacturers might copy Air Création's ideas and dilute their efforts. But Air Création's director of research and development Gilles Bru (pronounced approximately "Jeels Brew") was willing to talk quite openly about it. Since the Kiss wing dominates the change from earlier Buggy trikes, most of my report focuses on this wing. 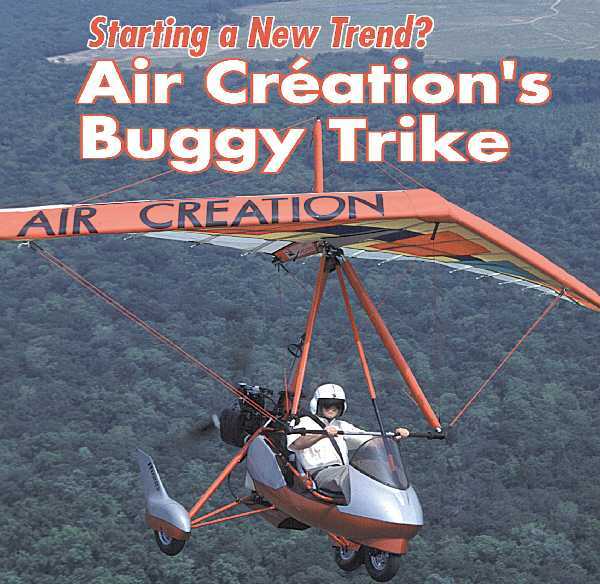 For additional comments about the Buggy chassis, see "Pilot Report: Air Création's Buggy Trike," April '99 Ultralight Flying! magazine. Gilles expressed that developments to their simple, single-surface Fun wing are evolutionary. Contrarily, he indicated that the Kiss wing is all-new. So much in aviation is a function of incremental developments. It's a safe way to proceed but it doesn't leapfrog to new levels of sophistication. The computer is known for such jumps; aviation isn't. Of course, Air Création has many years of experience so in a sense it's all evolutionary. But they started with a clean piece of paper and kept working until they had the right combination. Saving weight is a virtual religion in aviation. Let's start with that. Gilles indicated they reduced the weight of the wing by 10 kilos (22 pounds), resulting in significantly lighter handling forces. I've been preaching light weight to anyone who will listen and the rationale remains sound. Especially in a weight-shift vehicle, less weight is easier to displace. Air Création also completely redesigned the wing's crossbar. This important member acts much like a spar in a conventional 3-axis ultralight. Switching to stiffer-but-lighter 7075-T6 aluminum and an increased diameter wall with decreased wall thickness saved a few pounds yet preserved the rigidity a spar needs. More recently, the company introduced their new Kiss 450 wing. This is a larger wing with a 992-pound capacity (450 kilograms, hence the name). It has about 15 square meters of area, says U.S. representative John Kemmeries. To maintain the superb handling that impressed me on the Kiss 13, Air Création uses some anhedral. No, not dihedral, anhedral. Dihedral is, of course, the upward angle formed by the two wings of many airplanes. Look at any low-wing Piper and you can't help but note the dihedral. Quicksilver ultralights also use a lot. In all cases, this provides more stability. Aircraft with generous dihedral practically straighten themselves out of turns. Not everyone believes so much dihedral is needed. For example, M-Squared aircraft that resemble Quicksilver use much less dihedral. The benefit? A flatter wing will have lower resistance to turn input, which lightens control forces. This is a fine adjustment that every designer does somewhat differently. In hang gliders, employing weight-shift control like trikes, too much resistance to control input can wear you out. So hang gliders employ negative dihedral, or anhedral. This reduces control forces and makes the wing more responsive to weight-shift control. Stability in turns is adjusted by carefully setting the amount of anhedral. Some military jets and other aircraft also use anhedral, lending credibility to the technique. Though perhaps not as interesting as anhedral, Air Création also uses a special rip-stop cloth on their wings. Gilles claims it is nearly impossible to tear this cloth and that it has been in existence about 2 years, first used by the sailboat industry. This probably doesn't affect handling but it will make your trike wing last longer. How Effective Is It? Control forces and pressures are important to handling satisfaction, but they aren't everything. Gilles says the Kiss wing is physically lighter in roll though their XP-12 wing has a faster roll rate. When Air Création redesigned the crossbar around 7075-T6 aluminum versus 6061-T6 aluminum, they put the wing on a kind of strength diet as 7075 is harder than 6061. The stiffer airframe also complemented their move to a 130° nose angle. Another hang gliding convention, this measurement would be called sweep in a conventional ultralight. Less sweep helps in glide performance whereas more sweep contributes to better handling. The Kiss wing is sufficiently lightened that Air Création could push the nose angle to gain an edge in performance, says Gilles. Air Création's XP series wings use 120° nose angle compared to the Kiss' 130°. Generally speaking, narrower nose angles are associated with better handling but lower performance, though these differences are subtle. In fact, none of the changes employed on the Kiss wing are striking. But they combine well. A number of alterations are not visible but help this process of handling improvement. On wings that rely on weight-shift for control movement, flexibility in the airframe is important to allow one side of the wing to be shaped differently than the other. Movement of the weight under the wing is the primary action and causes some of the total response to control input, but the shifting of the sail and the resulting airframe movement is also a factor. Yet the talk of stiff 7075-T6 aluminum tubing makes it sound like flexibility would be reduced. To enhance flexibility, Air Création designer Gilles Bru created a new crossbar linkage system, both at the crossbar/edge junction as well as at the root, which I believe may have helped Kiss's handling. At the leading edge junction the wing has a universal bracket setup that permits greater airframe flexibility than hard bolting. Near the center section - as importer John Kemmeries described it to me when I was unable to examine it visually - "You'll find a cup-and-ball arrangement which eliminates bending loads and changes them to compression loads." With lighter handling forces Air Création could also make the wing larger. The Kiss wing is just over 13 square meters (about 148 square feet), whereas the XP-12 wing that also exhibited reasonable handling was only 12 square meters (130 square feet). Best of All Worlds Handling is important to many pilots and me. Air Création's hard work to improve this quality on the Kiss wing is laudable, but you can never forget performance. Pilots demand it. That's why pushing the nose angle is smart. The wing also can carry more, another form of performance. Since it gained square area, the Kiss wing has seen an increase in its gross capacity to 400 kilos (880 pounds). This is an increase of 50 kilos (110 pounds) over the XP-12 wing, which gives it a more reasonable capability for 2-seat operations. The Buggy trike chassis with the XP-12 wing is really a solo machine in which you can carry an occupant occasionally. By boosting the wing area and therefore capacity, the Buggy with a Kiss wing is more reasonable to operate with two aboard. John Kemmeries reports the brand-new Kiss 450 can carry even more, raising the maximum takeoff weight to 992 pounds, a genuine 2-seater for those who fly dual most of the time. He also indicated it will slow down better than the smaller, more heavily loaded Kiss 13. Certainly, the Kiss scooted. This had been a strong point of the even-smaller XP-12 wing and I was pleased to see the larger Kiss could match it. I was able to see about 88 mph at maximum pull-in and maximum power without gaining altitude. Throttling back, I was also able to sustain altitude at only 4,500 rpm in what I would say is a low power setting number among most ultralights. As they pushed the envelope of handling and performance, Air Création also managed to keep the solid stability profile of their previous series of wings. According to Gilles, no matter where you push the control bar of the Kiss wing - within the trike's framework - you cannot stall. He was so confident, he said that even if you exaggerate the control motion ending up with the bar full forward it still will not stall. On the other hand, the company's manual definitely cautions stall practice, authorizing them only "in glide path with a progressive speed reduction and throttle to idle position." That's how I do my first stalls, but I wasn't aware of the operator's manual warning when I got more aggressive with stalls. I definitely did not stay with the preceding sentence yet I found no evil characteristics. Fortunately, Gilles obviously feels aggressive stalling can't be too bad or he would not have been so confident in his comments. Despite my successful actions and Gilles' assurances, the manual also states, "To avoid tumbling risk, the stalling exercises must be imperatively carried out with [the] engine at idle, with a slow decreasing speed obtained by a progressive control bar pushing out." Not following a well-written manual is asking for trouble, so I don't encourage the more aggressive stalls I sampled. Slick and Sleek The Kiss wing was mounted over a Buggy trike chassis, which has proven popular among American consumers. I haven't spoken much about the chassis or carriage as it has not changed since my last evaluation in April 1999. Actually the fairing did go through a minor cosmetic change or two but the beautifully achieved package didn't need alteration. In this test trike, Air Création had fitted an option that was not present on my last flight test. Making the Kiss Buggy even more suitable to training was a rear seat steering bar complete with a foot throttle. Normally an instructor uses the hand throttle to override incorrect student settings. However, trike pilots become accustomed to using the foot throttle, so adding one for the instructor is a nice touch. Air Création's Buggy is a slick and sleek trike carriage much like their popular Clipper (though the Buggy carries a lower price tag due significantly to the Clipper's Rotax 912 engine). The French trike manufacturing giant has consistently recorded strong sales, which I believe reflects this attention to detail. Factory reps also note that their high level of customization helps prevent competitors from copying them easily. You'll spend some real money to have a Buggy with the Kiss wing, at $18,415. However, several reasons soften the blow. First, the Kiss/Buggy is delivered ready to fly. Since it doesn't make FAR Part 103 for single-place operations, you'll have to utilize it as a trainer with the proper credentials. Operation is also possible under FAA's glider/trike category (see "USUA Headquarters Report," September '00 Ultralight Flying! magazine). If 18 grand is way out of your league, don't forget Air Création offers the same quality in lower-cost trikes. For example, their Twin 503 costs $12,662 and it also comes ready to fly and no painting required. It lacks the fairing, uses the 50-hp Rotax 503 instead of the 66-hp Rotax 582 but otherwise employs Air Création's marvelous hardware. If you're looking for a single-seater, you can start as low as $10,308 for the Fun Racer, which remains one of the most enjoyable trikes on the market in my opinion. Since the trikes are all built in France, currency exchange rates can alter these prices. 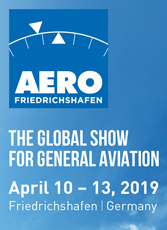 During early 2001 the prices could actually decline due to a strong dollar, but this may not stay the same so check with importer Kemmeries Aviation for the latest pricing. Since my last report, Kemmeries has invested in Air Création directly, becoming a significant shareholder. 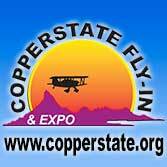 That may provide an interesting topic for hangar gossip but what it means to prospective buyers of Air Création ultralights is that you can expect dedicated, involved service. The trikes may travel a long way from the manufacturing plant, but help is right here in the United States. Kemmeries reports that he's stocking many parts. "You'd be hard-pressed to need a part I don't have," he says. You may even want to visit Kemmeries. His operation north of Phoenix, Arizona enjoys year-round good weather for flying and the locale offers plenty of open area for training and fun flights. If you visit the importer or one of his dealers, be sure to take a flight in a Buggy with the new Kiss wing. If you don't come away with a smile, you just don't get trikes (and you ought to try again). But I'll bet most who sample this delightful aircraft will be so pleased they'll just want to "Kiss that wing." Standard Features Based on the Twin trike chassis (in use for several years), Kiss 13 wing, weight-shift control, hand and foot throttles, nosewheel steering (push right, go left), nosewheel brake and fender, parking brake, lap seat belt, Buggy wheel pants, pneumatic suspension, instrument panel, water temperature gauge, C-gearbox, intake and exhaust silencers, full fairing with short windscreen, 10-gallon fuel tank, 3-blade composite prop, back seat storage. Options (larger) XP-15 wing, new Kiss 450 (15 square meters) wing also now available, 3-point shoulder belts, in-flight trim, ballistic parachute system, tachometer, hour meter, side bags, aerotowing system, kit option. Construction Aluminum airframe, fiberglass fairing, Dacron sailcloth wing covering. Made in France. Pros - New Kiss wing mates well to the Buggy chassis of 1999 to make a superior trike design, one of the best I've flown. Best flown solo, the Kiss Buggy will accommodate two. Wing is larger but handles dramatically better than 1999's XP-12 wing. Typical fabrication by Air Création; anyone who examines it carefully will admire it. Cons - Optimized as a single-seater, design requires attention when more heavily loaded with two occupants. Ideally you fly this solo with occasional 2-place operation. Though this is common, some buyers will be turned off. Too bad this isn't offered with the far simpler and very popular 50-hp Rotax 503. You only save a few hundred dollars by assembling (a 50-hour +/- task). Pros - Excellent trim system; works well and is universally labeled for clear operation (rabbit is faster/turtle is slower). Nosewheel brake system is more powerful than expected, especially given the light loading of trike nosewheels. Hand and foot throttles for both seats is a good addition with low weight penalty. Rear seat steering bar helps if you're instructing. Cons - No electric start makes it much lighter and that's good, but hand starting the Rotax 582 can be a workout. Reaching the pull starter from the front seat is a stretch. Trim system is great but it's a fairly costly option (about $400). Operating a Rotax 582 with liquid cooling requires more attention than an air-cooled Rotax 503. Pros - Dual hand and foot throttles in the rear position are a good improvement if you instruct in the Kiss/Buggy. Supportive back seat system is appreciated when flying solo. Minor changes to the fairing make it even slicker, though that was not an easy task. Large, comfortable, and secure steering pedals are better than some trikes' simpler pedals. Excellent, secure placement of kill switch and magneto switches (under throttle). Cons - Sewn-on control bar leg fairings are very light and better than nothing, but don't maintain the very high quality evident on the rest of the trike. Mast behind aft seat can be uncomfortable for that occupant (even though Air Création pads it). Lap belts are standard, shoulder belts a $250 option. No proper aircraft should have only lap belts in my opinion. I recommend a full-face helmet or one with a pull-down visor in the Kiss/Buggy. Pros - All Air Création trikes are easy to taxi owing to nosewheel dampening that makes it smoother to operate; trailing link suspension also helps. Most trikes are easy to maneuver through obstacles that would stop a 3-axis ultralight. Front fender deflects debris from runway on takeoff. All gear is suspended on the Buggy chassis. Brake is quite effective. Cons - For some 3-axis pilots the push-right/go-left steering of trikes is counterintuitive. Kiss wing is larger than previous XP-12, which makes it that much more of a handful in gusty winds; your arm muscles tire more quickly. Pros - Air Création conservatively says climb is 600 fpm but it certainly feels like more; my checks on a convective day saw up to 900 fpm. Takeoff ground break felt faster than with the older, smaller XP-12 wing of 1999. Visibility on takeoff and landing is huge in most trikes. Strong chassis and good ground clearance for off-field landings. As with many trikes, normal landings are quite easy to learn (3-axis pilots can learn "reversed" controls quickly with instruction). Cons - Good as the new Kiss wing is, it doesn't change the limited capability of trikes to deal with crosswinds (though you can learn other techniques easily); reasonably small wing area helps, though. Rotax 582 gives excellent takeoff performance but is more complex than a Rotax 503, requiring more awareness; for example, assure water temperature is up to a satisfactory range before committing to takeoff. Pros - Sharply improved handling is the main story with the Kiss/Buggy combo; it's so much better that even an old trike veteran like me was duly impressed. Even more significant was this achievement with more wing area (than 1999's XP-12 wing). Overall, I have to admit this is one of the three best trike wings I've flown on heavier trikes (others are AirBorne's Edge/Streak and North Wing's Apache/Contour). Cons - Virtually all of the handling criticisms I've had for years about heavier trikes are sharply reduced with the Kiss wing, so negatives are few. However, precise answers about how Air Création achieved the handling improvements remain unannounced. Crosswind limitations still apply despite excellent Kiss wing handling. No other negatives. Pros - The Kiss wing performed excellently, offering a top cruise of around 85 mph in my experience. At that speed, the wing was very manageable to control (not so on all heavier trikes). Rotax 582 offers a reassuring excess of power; engine ran absolutely flawlessly and was very smooth, a credit to Air Création's motor mount and shock mount system. Use of silencers on intake and exhaust make for quiet, neighbor-friendly operation. Cons - Still shouldn't load up the Kiss wing with two huge occupants unless you are well experienced; higher approach and touchdown speeds are certain. Fuel consumption remains higher with the 582, better than 3 gph in normal operations, more if doing touch and goes or lots of climbing. Larger winged, single-surface trikes land more slowly (and handle as well, but, of course, lack the higher cruise speeds). No larger fuel tanks could be fitted without disturbing the fairing's graceful lines. Pros - Factory says you can't stall the Kiss wing anywhere you place the control bar within its confines (though aggressive-enough action may still produce a stall). Very stable characteristics overall. Turns coordinate well (as with most trikes). Longitudinal and throttle response checks were positive. Adverse yaw is hardly noticeable. Optional 3-point harness is secure. Wing loading is more modest than smaller XP-12 wing. Cons - Lap belts are standard; I strongly recommend the shoulder belt option as lap belts aren't enough. Factory cautions in their manual against stalls at full power or aggressive action despite the craft's mild ways - perhaps a legal liability position? No other negatives discovered. Pros - Air Création makes as nice a trike as any producer in the world; their consistently strong sales reflect this attention to detail (it also helps prevent competitors from copying them so easily, say designers). While not inexpensive at $18,500, this is a deluxe trike that seems priced right for Americans - Air Création has other, more modestly priced trikes. U.S. support is more certain than ever since John Kemmeries became a shareholder of the company. Cons - Price is up about $1,000 from 1999, though this is only 5% over two years, about equal to inflation; Franc/dollar exchange rates are also a factor. The Buggy and Kiss wing combo is not appropriate for beginning trike pilots. The Rotax 582 makes for a more complicated installation and operations although Air Création executes the installation as well as any I've examined. Frankly, it's hard to fault this design if a trike appeals to you. For many years, I’ve been critical of trike handling. While I try never to forecast the future, I’ve gone out on a limb and predicted that rigid-wings will eventually become commonplace on trikes (though I don’t also predict delta wings will disappear). Going Rigid? Rigid-wings look a lot like modern hang gliders and trike wings in many ways, but they have control surfaces. Because these surfaces are deployed via weight-shift movements they neatly combine the benefits of 3-axis ultralights – lower control forces and good control authority – with the elegant simplicity of weight-shift. Rigid-wings can carry good weight and are somewhat faster than delta wings (called “flex wings” by hang glider pilots), and they also handle more easily. I think this makes them a nearly inevitable development. While I still believe rigid-wings are coming to trikes, it may take longer than I thought because the trike industry may finally be rising to the challenge. More Fun for Two People What could be more fun for two people than an Air Création Fun 450 trike? Okay, I don't really want to know the answer you were about to give. Next to that, those Frenchmen in Aubenau certainly know what they're doing. In the state of design and execution, Air Création arguably makes the finest trikes in the world. The Fun Racer was an early trendsetter, before everyone wanted to buy a 2-seater. The "Racer" part of the name came from the carriage and it acquired this name due to a lower-slung, racier look. The "Fun" part refers to the wing. This wing design is Air Création's entry as a single-surface model. It has worked so well for them that it has remained in their line almost since the beginning. To jazz up the Racer trike, a few years back they paired it with the XP-11 or XP-12 wings. At the time, I thought this was one of the finest flying aircraft of any kind. It was fast, stalled slowly and looked cool. When you ordered it with the Rotax 503 you had a real "racer." But most folks who thought about the Fun Racer elected the standard Rotax 447 engine and smaller, single-surface Fun wing. This made a very economical purchase and it fit FAR Part 103 if you didn't add much in the way of options. Those who wanted fast wings bought the Buggy with the XP-12 wing. Later the company offered the Kiss wing, a marvel of improved handling that didn't sacrifice much in the way of speed range. Now those looking for the high end of Air Création trikes may select the Clipper 912 with the iXess wing| assuming their wallet can take the $36,000+ hit. So, those not seeking the fastest, sleekest trike from Air Création may again gravitate toward Fun 450, which is the new wing mated to the Twin chassis. The latter has been in the Air Création lineup for years. It is the understructure of the Clipper and has proven itself over many years of use and refinement. Plus, the Fun 450 is a 2-seater where the Racer remains a single-place ultralight. So, the most fun two people can have in the air may be the new, larger, Fun 450 Twin. Then, after a day's flying, maybe you'll have time and inclination for that other fun activity for two adults. More Fun for Two People What could be more fun for two people than an Air Création Fun 450 trike? Okay, I don’t really want to know the answer you were about to give. Next to that, those Frenchmen in Aubenau certainly know what they’re doing. In the state of design and execution, Air Création arguably makes the finest trikes in the world. The Fun Racer was an early trendsetter, before everyone wanted to buy a 2-seater. The “Racer” part of the name came from the carriage and it acquired this name due to a lower-slung, racier look. The “Fun” part refers to the wing. This wing design is Air Création’s entry as a single-surface model. It has worked so well for them that it has remained in their line almost since the beginning. To jazz up the Racer trike, a few years back they paired it with the XP-11 or XP-12 wings. TWO-SEATER? - The Fun Racer series from Air Création has been a single-seater its whole life, until now. In typical Air Création fashion the seats are well-padded and comfortable (though not as elaborate as their Clipper seats). BIG WING - The Fun wing was enlarged when Air Création added the Twin carriage for two-person occupancy. Note the "single" surface wing actually has approximately a 30% double-surface. It can carry 450 kilos or 992 pounds at gross. SIMPLE RIG - Though the Fun has long been a simple aircraft (no fairing, for example), Air Création's hardware is used throughout, immediately qualifying the Fun carriage as topnotch. BIG FEET - Air Création's custom shoe-shaped steering pedals are useful for supporting your feet. In addition to steering, braking action happens on the left pedal while the right incorporates the foot throttle common to all trikes. HAPPY PILOT - The Fun racer, which flies slower with its single-surface wing, is built for two but offers a great view in an open-cockpit design for solo pilots as well. INSIDER VIEW - Designer Gilles Bru pries open the Fun 450 wing to show the wing/crossbar junction detail. The same parts are used on all Air Création wings and allow the use of thinner wall (lighter) tubing because stresses have been reduced through effective design. FULL DRESS - When a Harley motorcycle is equipped with all the functions and decorations any motorcyclist could want, it's often called a "full dresser." Air Création's Clipper 912 with the new iXess wing qualifies for that phrase by offering you everything you could want in a weight-shift aircraft. AERIAL BMW - The French producers have long used a very tasteful painting scheme for their faired trike carriages. With the overall refinement of the aircraft, this is one of the "BMWs" of the ultralight world. CAPTAIN'S CHAIR - Here's where you want to be: at the helm of a machine like Air Création's Clipper 912 with the iXess wing. A loaded panel greeted me when I took this seat for a flight evaluation. HAPPY FEET - If you do instruction from the rear seat of a trike, you have to rely on the student to make correct throttle applications (other than a hand throttle). That isn't always optimal, so Air Création offers rear-seat steering and foot throttle. NOT ORDINARY - Air Création's sense of detail refinement is par excellence. Consider the "lowly" seat. While many are comfortable, most aren't convertible. On the Clipper, you can make the rear seat into a backrest and storage area. TRIM OUT - Other high-end trikes offer trimmers (as they're usually called by trike builders), but no others have made the use of that black knob any clearer than these simple instructions. A rabbit means faster in every language, and a turtle means slower. HARD WORKERS - Gilles Bru (left) and Jean-Luc Tilloy have come almost every spring to Florida for the season's opening airshow. They are rewarded with good U.S. sales, partly thanks to their strong partnership with Arizona importer John Kemmeries (who now owns 20% of Air Création France). After flying all their models, after visiting with company representatives on several occasions, and after visiting the factory in Aubenau, France, I feel like I know the Air Création people. So I should have known they wouldn't just make a new wing purely for marketing reasons. Indeed, when I few the iXess after flying their new Fun 450 wing (also reported in this article), I came away with that same head-shaking-in-wonder feeling that has affected me before. I know a little something about delta wing design, having been around hang gliding since the early 1970s, and trikes since their beginning. That helps me to comprehend how far these wings have progressed and how much harder it is to extract additional gains year after year. Trike wings (and hang gliders) generally trade more glide or speed performance for handling ease. At least, that was how it used to be. Today, that statement must be modified to reflect the surprising capacity of modern wing designers to find more performance at the same time they refine the handling. In short, the iXess is a triumph of cultured wing design that sends notice to every other developer. If you stumble over the name, don't feel alone. Many folks don't know quite how to say it. American importer John Kemmeries explains that iXess is pronounced EYE-excess. Tale of Two Wings This article will focus on the deluxe Clipper 912 with the iXess wing, but that isn't the only new chariot Air Création debuted in 2004. They also introduced their first 2-place Fun chassis fitted with the enlarged Fun 450 wing. Most Air Création followers know the Fun 14 wing paired with the single-seat Fun Racer trike. The "14" refers to square meters (150 square feet). Now, the factory has increased the range to the Fun 450, a larger, 17-square-meter, mostly single-surface Fun wing. It is mated to a Twin carriage, a long-standing 2-seat tandem cart from Air Création. What I'm describing is the first Fun for two people (see sidebar, "More Fun for Two People"). This covers one end of the trike-buying spectrum. The other end is the Clipper 912 with the iXess. Interestingly, the same wing structure is used inside the Kiss, iXess, and Fun wings Air Création produces today. This simplifies the effort of manufacturing and eases parts supply at dealerships. And it shows that the art of delta wings is not in the frame, important as that is. The larger share of what makes the wing work is the sailcut, rib patterns, and numerous little refinements that improve handling and speed range at the same time. One such example involves the use of 7075-T6 alu minum tubing on the forward leading edge, the crossbar, and the ribs. This is a strong, more rigid alloy that can be used with thinner walls (to a point) without sacrifice. However, its rigidity stands in the way of lighter handling, so more-flexible 6061-T6 aluminum is used on the aft leading edges to permit more sail shifting. Air Création designer Gilles Bru showed me a construction at the leading/crossbar junction, which allows the use of thinner wall tubing than was possible with the previous brackets. Where once long bolts and beefy brackets were used, now a small, lighter set of custom hardware does the job (see photo, "INSIDER VIEW"). As with top hang glider designers, the cloth material on the Fun wing is carefully chosen. For the Fun wing, very dimensionally stable Trilam is used on the leading edge where more flexible Hydranet is employed for the main sail body. Air Création likes Hydranet as it does not propagate a tear should, for example, a rock be thrown up by the wheels or prop. On the more sophisticated iXess, the entire sail is made from Trilam as it suits higher speeds better. The iXess also has a cloth doubler on the trailing edge due to stress from a tautly stretched wing. On the Fun 450, the trailing edge is merely hemmed. To help maintain the fine handling of the Kiss wing, a portion of the iXess undersurface uses spinnaker cloth, a modestly lighter cloth with more yield. The more flexible cloth keeps the relationship between upper and lower surface more elastic to help with handling and low-speed flight characteristics. The concentration of spinnaker cloth is at mid-span where it can do the most good. From the crossbar leading edge junction toward the nose, a PVC plastic material is used to smoothen and retain the shape at the leading edge; this helps the iXess retain the speedy ways of the XP series. More common and less rigid Mylar is used on the outer portion of the wing; this change of materials is another subtle aid to turning qualities. 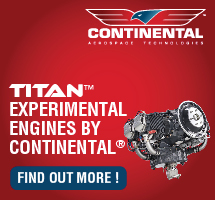 Due to their experience with the DHV test vehicle, Air Création has been able to eliminate the older-style tip After flying all their models, after visiting with company representatives on several occasions, and after visiting the factory in Aubenau, France, I feel like I know the Air Création people. So I should have known they wouldn't just make a new wing purely for marketing reasons. Indeed, when I few the iXess after flying their new Fun 450 wing (also reported in this article), I came away with that same head-shaking-in-wonder feeling that has affected me before. I know a little something about delta wing design, having been around hang gliding since the early 1970s, and trikes since their beginning. That helps me to comprehend how far these wings have progressed and how much harder it is to extract additional gains year after year. 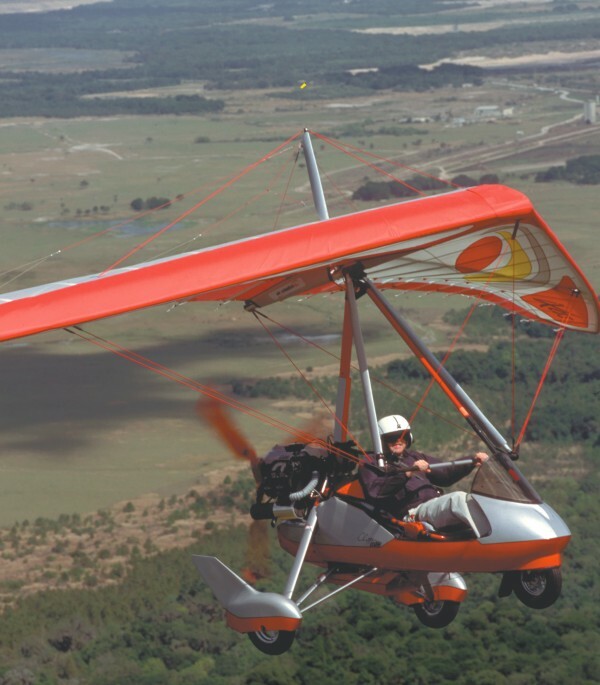 Trike wings (and hang gliders) generally trade more glide or speed performance for handling ease. At least, that was how it used to be. Today, that statement must be modified to reflect the surprising capacity of modern wing designers to find more performance at the same time they refine the handling. In short, the iXess is a triumph of cultured wing design that sends notice to every other developer. If you stumble over the name, don't feel alone. Many folks don't know quite how to say it. American importer John Kemmeries explains that iXess is pronounced EYE-excess. Tale of Two Wings This article will focus on the deluxe Clipper 912 with the iXess wing, but that isn't the only new chariot Air Création debuted in 2004. They also introduced their first 2-place Fun chassis fitted with the enlarged Fun 450 wing. Most Air Création followers know the Fun 14 wing paired with the single-seat Fun Racer trike. The "14" refers to square meters (150 square feet). Now, the factory has increased the range to the Fun 450, a larger, 17-square-meter, mostly single-surface Fun wing. It is mated to a Twin carriage, a long-standing 2-seat tandem cart from Air Création. What I'm describing is the first Fun for two people (see sidebar, "More Fun for Two People"). This covers one end of the trike-buying spectrum. The other end is the Clipper 912 with the iXess. Interestingly, the same wing structure is used inside the Kiss, iXess, and Fun wings Air Création produces today. This simplifies the effort of manufacturing and eases parts supply at dealerships. And it shows that the art of delta wings is not in the frame, important as that is. The larger share of what makes the wing work is the sailcut, rib patterns, and numerous little refinements that improve handling and speed range at the same time. One such example involves the use of 7075-T6 aluminum tubing on the forward leading edge, the crossbar, and the ribs. This is a strong, more rigid alloy that can be used with thinner walls (to a point) without sacrifice. However, its rigidity stands in the way of lighter handling, so more-flexible 6061-T6 aluminum is used on the aft leading edges to permit more sail shifting. Air Création designer Gilles Bru showed me a construction at the leading/crossbar junction, which allows the use of thinner wall tubing than was possible with the previous brackets. Where once long bolts and beefy brackets were used, now a small, lighter set of custom hardware does the job (see photo, "INSIDER VIEW"). As with top hang glider designers, the cloth material on the Fun wing is carefully chosen. For the Fun wing, very dimensionally stable Trilam is used on the leading edge where more flexible Hydranet is employed for the main sail body. Air Création likes Hydranet as it does not propagate a tear should, for example, a rock be thrown up by the wheels or prop. On the more sophisticated iXess, the entire sail is made from Trilam as it suits higher speeds better. The iXess also has a cloth doubler on the trailing edge due to stress from a tautly stretched wing. On the Fun 450, the trailing edge is merely hemmed. To help maintain the fine handling of the Kiss wing, a portion of the iXess undersurface uses spinnaker cloth, a modestly lighter cloth with more yield. The more flexible cloth keeps the relationship between upper and lower surface more elastic to help with handling and low-speed flight characteristics. The concentration of spinnaker cloth is at mid-span where it can do the most good. From the crossbar leading edge junction toward the nose, a PVC plastic material is used to smoothen and retain the shape at the leading edge; this helps the iXess retain the speedy ways of the XP series. More common and less rigid Mylar is used on the outer portion of the wing; this change of materials is another subtle aid to turning qualities. Due to their experience with the DHV test vehicle, Air Création has been able to eliminate the older-style tip struts. They are not as effective in high-load, high-speed situations when they can bend downward. Instead, designers use pitch lines or luff lines further out on the wing, to about two-thirds of the span. These lines, running from the kingpost, impart some wing reflex when loads increase. Air Création believes the lines are superior to the tip struts because the more load the wing is seeing, the more effective are these lines. The new iXess wing is only made in a single size thanks to its versatility. Yet the Air Création trimmer system further extends usable speed range. The wing can handle 450 kilos, or 992 pounds, of load and the entire aircraft is tested for limit loads of +6, -3 G. Squeezing the extra handling and performance is no small challenge. Even the experts take time to get it right. Development of the iXess started in 2000, yet it was not seen in the U.S. market until 2003. The iXess wing uses nine lower ribs, with somewhat wider spacing at the tip to allow more shifting of the wing for improved handling - the way the sail and airframe move relative to one another is what allows a delta wing to respond so well to weight-shift control inputs. The upper surface of the iXess has 13 ribs to maintain a precise airfoil shape. In all, 44 ribs go into the iXess wing. Bru prefers to say, it has "a lot" of ribs. Air Création claims top honors in competition with the iXess wing. In preproduction configuration, the wing helped secure a first-place win at the 2001 World Championships and repeated this finish at the 2002 European Championships. Superb Clipper Air Création trikes have been painted red as long as I've known the company. The choice may be smart. Leading executives of automobile companies say red is the best color for marketing. When Air Création introduced the Clipper chassis, they added to the fairing surrounding the cockpit, and added a color. A tasteful gray or silver lower surface is separated from the company classic red by a black pinstripe. The only change from the earlier Clipper models, due to the larger engine, is the Clipper 912 logo on the side. The model still uses the little windscreen that someone once called "a windshield for your knees." In reality, the fiberglass nose easing smoothly to the tinted windscreen moves most of the air around the front occupant. However, the windscreen does little to protect your face; therefore my recommendation, and the practice of the factory, is that you use a full-face or pull-down visor helmet. Three options appeared on my test aircraft and that's saying something since the model is very well-equipped as part of its base price. One item is purely cosmetic or style oriented. The lower surface of the iXess has a custom color treatment that you must pay extra for but through this means you can personalize your aircraft. More functionally, steering for the rear seat along with a rear-seat foot throttle will help if you give rides or lessons with the new pilot up front. If you rarely do this, you'll have little call for these options. The test machine had Air Création's very slick trimmer system, or simply aerodynamic trim, of another sort. On tailless wing trikes, conventional trim won't work and you cannot use a stick reposition system like Quicksilver, Sonex, or others use. Trikes use a series of luff lines or pitch lines that hold up the wing's trailing edge when the rest of the wing draws tighter or forward. Like regular trim, this is sufficiently subtle that you might not notice the movement, but you'll notice the relief on the control bar. Since the Clipper body fairing is built over the Twin chassis, the interior of the Clipper 912 is familiar to 2-seat Air Création pilots. Along the seat frame you'll find the hand throttle console on the right. Under this plastic housing are the kill switches, thoughtfully located so you don't inadvertently bump them to the "off" position. The Clipper 912, with that big 4-stroke 4-cylinder engine, adds a carburetor heat switch on the left side and a choke control approximately at the front occupant's shoulder on the right side seat rail. Air Création "rudder pedals" are used to steer the aircraft on the ground, via the often-maligned but quite workable push-right/go-left steering. In fact, trike steering is similar in operation to bicycle or motorcycle handlebars, or snow skis. Air Création's pedals are large, offering good foot support (partly so you don't rest them on the fairing floor). The right pedal pivots as a spring-loaded throttle for takeoff and landing. The left one operates the nosewheel brake. I was pleased to have recoil three-position seatbelts for both positions. And while this particular rig was not equipped with a ballistic parachute, the company sells so many of them that they are one of a few companies to develop and incorporate an automatic engine kill switch into the rocket motor's pull handle. In Air Création's case this was done in cooperation with BRS engineers to assure proper execution. Having such a switch saves the pilot one vital step. Nosewheel brakes aren't known for their stopping power on trikes due to the light nosewheel loading. So I was surprised by the very strong braking power on the Clipper 912. On the downside, when turning, it is easy to activate the brakes so you must concentrate on steering with your heel. Rocket Launch Takeoff Bru suggested that I take off and land with the trimmer in the zero position. The trimmer marks are very easily understood in any language, appropriate for a French company selling around the world. His advice may have been offered because the wing handles more predictably in this setting, important in such critical phases of flight. It also helps you keep your speed in the correct range. Setting the trimmer to neutral may also be useful to help contain that big engine driving you into the air. I flew solo and after the first launch, I never used more than about 60% power to get aloft. Density altitude was only about 1,500 feet despite the heat and humidity, but I can envision high elevation sites where 81 horsepower may be necessary. Two-place flying with big American occupants could be another reason. Of course, you'll pay for this engine much more dearly than the Rotax 582. Despite the substantially heavier Rotax 912 engine and despite a fairly wide cockpit fairing, I found the iXess handling to be very good, even flying solo. My experience suggests the larger XP-17 wing does not handle nearly as well on the Clipper 912 chassis as the iXess. The XP wings are great for cruising but the large model was pretty heavy in roll. The versatile ways of the iXess on this carriage are significant enough to eliminate the need for a second wing size. Since the trimmer results in a repositioning of the control bar, I found the handling was actually better when the trim was set to high speed as this meant I did not need to pull aft on the bar with as much effort; it was already further aft. When trim was set to slow, I had to pull aft to help accelerate into the turn. Such is a common trike motion: pull in, shift to the side, and push out. It has been called the "J" stroke and pushing out is similar to holding backpressure on a control stick in a 3-axis airplane. This is probably why Bru encouraged me to approach for landing in the neutral trim position, to facilitate better control. Bru also says the iXess wing does not perform or handle much differently whether one or two people are on board. I can hardly overemphasize what an accomplishment this wing design represents. Bru says the Fun 450 Fun wing travels 40 to 100 km/h (25 to 62 mph) when flown solo, ranging to about 120 km/h (75 mph) when flown dual. My experience was nearly identical to his statement. Conversely, the iXess wing has a range of about 50 to 140 km/h (31 to 88 mph), dual or solo. Maximum dive speed with no power in the Clipper 912 indicated 72 to 75 mph when the trimmer was left in the neutral position. Thinking back to trikes in the 1980s (most of which maxed out at perhaps 50 mph), this seems a blazing speed achievement. Trim speed in the neutral setting was about 58 mph. When the trimmer was turned all the way to the slowest setting (tighter luff lines), speed dropped to 47 mph; conversely, when turned to the faster (looser) position, speed rose to 64 mph. Turning the trimmer to slow tightens the luff lines pulling up on the trailing edge, which creates more reflex at the trailing edge, raising the nose, and thereby slowing the aircraft. Going the other way loosens the lines, which allows the wing to flatten and fly faster. With the trimmer in the fast position and pulled in for maximum nose-down at nearly full power, I was able to produce an indicated speed of 83 mph, very close to what Gilles had promised. The difference may be no more than instrument error. Beautiful Behavior Turning to the slow end of the range, the iXess wing never broke over in stalls even with the control bar all the way out to the forward support tube, as far as I could reach. Even on a bumpy day, the trike was highly stable throughout the stall routine. I did my usual routine of power-off, full power-on, and accelerated stalls in each direction at 40° to 45° of bank. Always, the machine behaved perfectly. I measured descent rate at 500 to 600 fpm with the engine at idle. Bru thought that sounded a little high and suggested that if I'd slowed down further, as I'd considered, that the rate of descent would have been lower. I had conducted my test in the neutral trim position with my hands off the bar (so about 58 mph). In the slow trim position (about 47 mph), the descent rate might have dropped by 100 to 200 fpm, he thought. Talking about the performance range of the iXess, Bru wanted me to mention the overall efficiency of the wing design, and I can say unequivocally that I find it to be their best wing yet. I've flown the smaller and larger Fun wing, the Mild 16 wing, the 11-, 12-, 15-, and 17-square-meter XP wings, the Kiss 13 (square meter) and 450 (kg) wings. After all that, I find their best work to date is the iXess. Though I've been around hang glider designs for more than 30 years and understand all the developments they've been through, I'm still amazed at how these talented designers can squeeze ever-better performance out of the wing while improving the handling. In general thinking of delta wing design, you can increase performance or improve handling, but not both at the same time. The Kiss wing was an excellent handling improvement and the iXess does it one better while retaining the speedy characteristics of the XP series. Put it together with the elegant and comfortable Clipper 912 chassis and my ending comment is, "Bravo, Air Création, bravo!" Standard Features 81-hp Rotax 912 engine with electric starting, Arplast 3-blade prop, Clipper chassis with deluxe cockpit fairing and short windscreen, iXess wing (available in only one size), hand and foot throttles, nosewheel steering, nosewheel brake and fender, parking brake, 3-point recoil seatbelts front and rear, 3-wheel suspension, instrument panel, water temperature gauge, 10-gallon fuel tank, back seat storage (acting as seat back). Options Kiss 450 wing also available, carburetor heat, in-flight trim (called "Pack Vmax" by Air Création), ballistic parachute system, rear-seat throttle and steering. Construction Aluminum airframe, fiberglass fairing, mixed fabric sailcloth wing covering. Made in France (with 20% ownership by American importer). Distributed by U.S.-based importer. Pros - New iXess wing suits mission of Clipper 912 and is one of the best wings ever from Air Création. The wing is a good improvement over the earlier XP-17 wing mated to the 912. Beautiful fabrication of all components; excellent engine installation. Perhaps the most versatile design the French company has ever introduced. Cons - Aircraft with everything on them generally cost significantly more; so does the Clipper 912 with the iXess. Combine that with a soaring euro-to-dollar exchange rate and expect well over $36,000 (at current exchange rates) for the aircraft in these photos (though it is deluxe. Lower-cost models are available). Pros - Excellent trim system; works well and universally labeled (see article). Optional hand and foot throttles for both seats. Optional rear-seat steering bar helps if giving rides/instruction from back seat. Excellent, secure placement of kill switch and magneto switches (under throttle). Brake on left pedal gives positive feedback. Cons - No landing aids like flaps (true for all trikes so far). Since the Clipper 912 iXess comes with almost everything a trike should have, it's hard to fault its systems. Pros - Nosewheel brake system is more powerful than expected. Dual hand and foot throttles with rear-seat steering position are a good improvement if you want to give rides from the back seat of your Clipper 912. Cargo seat system supports your back when flying solo. Sleek, classily styled cockpit fairing is very roomy inside. Highly secure steering pedals, especially good, as they also support your feet. Cons - Full-face helmet or one with a pull-down visor recommended; won't appeal to everyone. No matter how well done it is, the Clipper still uses typical trike wrong-way steering and that vexes some buyers. Pros - Large, supportive foot pedals, nosewheel dampening, and trailing link suspension makes the Clipper 912 very positive to ground handle. Fender and enclosure deflect dust and debris on takeoff. All gear is suspended. Brakes are more powerful than expected. Rear-seat steering and foot throttle allow back seat operations. Cons - Push-right/go-left steering of most trikes remains counterintuitive for conventionally trained pilots. The iXess wing is an improvement over the XP-17 once delivered with this trike chassis, but it's still a handful to hold still in gusty winds. Needed full-face or visor helmet restricts ground visibility somewhat. Pros - Fast ground acceleration, short takeoff roll and breathtaking climb rate define launching this Rotax 912-powered aircraft. The iXess wing also makes takeoff ground break come fast. Very good energy retention. Good visibility on takeoff and landing. Very strong chassis and good ground clearance for off-field landings. Cons - The Rotax 912 is possibly too much power for beginning trike pilots to handle (when solo, I took off most times with about 60% throttle). Fairly fast-flying wing means ground rolls can be speedy, tougher for those less certain about push-right/go-left steering. Pros - Even for someone familiar with delta wing design, I find it hard to believe Air Création had further improved handling without sacrificing performance, but they did! The iXess wing has most of the light handling of the earlier Kiss wing with most of the speed performance of the XP series. Trimmer system eases handling pressures in some situations. Cons - The iXess wing is so well-achieved that handling negatives are few. Significant crosswind limitations still apply despite excellent iXess wing handling. And keeping a pivoting wing steady while taxiing in gusty winds can demand some muscle power. No other negatives. Pros - Air Création's latest iXess wing performed brilliantly, with maximum cruise of 85 mph in my experience. Well-achieved trimmers help make more effective use of performance range. Even at high speeds, the iXess provides good control authority. 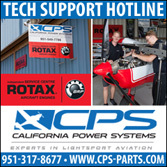 Rotax 912 brings an abundance of power. Air Création engine mount made for smooth operations. 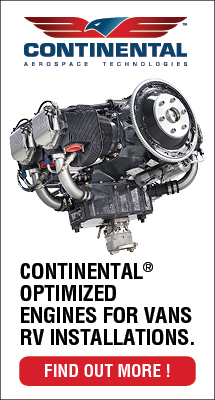 Cons - Plenty of power can be too much power for pilots unprepared for this level of performance. Larger single-surface trike wings can land more slowly than the iXess; 2-place operations for beginning trike pilots need to be done alertly. No other negatives. Pros - Beautifully behaved ultralight. All stalls were very benign; did not break (though very aggressive entry may produce a stall break). Excellent stability characteristics throughout the speed range of the iXess. Longitudinal and throttle response checks were positive. Three-point harness is secure. Cons - Some overbanking tendency noted if bank angles become steep - common in trike or hang glider wings, which employ some anhedral. Like most trikes, the iXess cannot be steeply dived, even with power reduced (with too much power, no dive is possible). No other negatives discovered. Pros - Air Création's Clipper 912 iXess is a weight-shift trike done to perfection - this aircraft is about as good as it gets, except for whatever the company does next. Air Création has other, more modestly priced trikes. U.S. support is very solid with American John Kemmeries of Air Création USA owning part of the French company. Cons - Price will be a barrier to some pilots at more than $36,000 (depends on various factors; call company rep); this may also affect eventual resale. The Clipper 912 iXess may not be appropriate for beginning trike pilots. The Rotax 912 is much admired but a more complicated powerplant to maintain. Overall, it's quite hard to fault this aircraft. After flying all their models, after visiting with company representatives on several occasions, and after visiting the factory in Aubenau, France, I feel like I know the Air Création people. So I should have known they wouldn’t just make a new wing purely for marketing reasons. Indeed, when I few the iXess after flying their new Fun 450 wing (also reported in this article), I came away with that same head-shaking-in-wonder feeling that has affected me before. I know a little something about delta wing design, having been around hang gliding since the early 1970s, and trikes since their beginning. That helps me to comprehend how far these wings have progressed and how much harder it is to extract additional gains year after year. Trike wings (and hang gliders) generally trade more glide or speed performance for handling ease. At least, that was how it used to be. Today, that statement must be modified to reflect the surprising capacity of modern wing designers to find more performance at the same time they refine the handling. LET'S GO! - If this were your house and hangar, you could be flying in minutes. Such a colorful rig parked out front would generate its share of stares. Note the extensive body fairing. NICE BITS - The Air Création hardware cleanliness is second to none that I've ever seen. This photo hardly does justice to the finely finished workmanship. CLIPPERESQUE - The pod is clearly based on Air Création's top-of-the-line Clipper. The smooth but tiny windscreen does deflect a lot of air. LOOKIN' ATCHA - Air Création uses full-face helmets, which offer optimal protection in an open-cockpit ultralight. A 3-point harness system (optional) recoils just like in your car. Note the cargo area formed by reversing the rear seat. TRIM SYSTEM - This is a highly workable trim system able to change airspeeds by 20 mph or more, but it is also easy to interpret: the rabbit is quicker, the turtle slower. Got it? HUMAN KINDNESS - Shock absorption (A), recoil seat belt systems (B) and passenger arm protection from the hot exhaust (C) all show Air Création's efforts to protect the occupants. ONE PLUS ONE - Literally, Air Création intends the Buggy for single-place flying with only occasional use of the second seat. If you need a regular 2-seater, buy the Buggy with a larger (optional) wing. LONG LASTING - Leather pads protect the vital control bar corner, dual side wires add redundant strength, and lightweight fairings reduce drag. Note the dual side wires adding redundancy to these highest-loaded wires. Red is the best color for marketing reasons I was told by a Detroit car marketing executive with a half million a year salary. If you've seen a Chrysler TV ad recently, you can see they painted all the cars and trucks bright red. Standard Features Twin trike carriage, XP 12 double-surface wing, weight-shift control, hand and foot throttles, steerable nosewheel (push-left, go-right) with brake and mudguard, parking brake, wheel pants, pneumatic suspension, instrument panel, lap seat belt, regulator, water temp, Rotax C gearbox, intake/exhaust silencers, full fairing with windshield, 3-blade composite prop, back seat storage. Options Other trike wings, Rotax 503 dual carb engine, Rotax B gearbox, 3-point recoil shoulder harness, dual foot controls, 2-blade wood prop, ballistic emergency parachute, tach, hourmeter, side bags, aerotowing system, fully-assembled option. Construction Aluminum tubing, metric "AN" hardware, Dacron® sailcloth. Made in France. Pros - New hybrid "one-plus-one" design allows 2-place flight but optimizes use by a single pilot (2-place trikes are often flown solo). Slick execution, like all Air Création trikes. Beautiful hardware and loaded feature set. Wing is well-crafted to maximize its performance and handling potential. Reliable long-time producer of trikes, always innovating. Cons - Rather costly at $17,590 fully assembled ($16,990 for 30- to 60-hour assembly kit). Should not be flown by two large persons, as wing is too small for low approach speeds or in rough air (though you can change wings to the larger XP 15). Rotax 582 may deliver loads of power performance, but is more complicated than many pilots need. Pros - Excellent trim system which I find comparable to many 3-axis aerodynamic trim systems; not easily achieved on a tailless weight-shift design. Nosewheel brake is surprisingly effective, and very accommodating pedals assure your feet don't slip off in bumpy air. Dual hand and foot throttles with dual ignition switches and kill switch in a "throttle quadrant." Cons - No electric starter offered on the Buggy, as Air Création is trying to keep the trike light. Smaller fuel tank, also to keep weight down. Brake is nondifferential. Optional trim system (though excellent) is costly at more than $400, though you also get faired control bar and kingpost tubing with the option. Rotax 582 will require more attention than a 503. Pros - Best seatback support yet from Air Création with (optional) retractable 3-point shoulder belt system. When folded for support (rather than a second seat), the seatback forms a closed cargo area. Foot-shaped pedals are secure and comfortable. Dual foot/hand throttles are excellent with built-in easily-reached switches; hand throttle overrides foot throttle for in-flight ease. Numerous options can further refine this well-thought-out model. Cons - Lap belts are insufficient on any aircraft; order Air Création's recoiling $240 3-point system. Regardless of the smooth and beautiful fairing, trikes remain windy at higher speeds; I recommend a full-face helmet for regular trike flying in the Buggy (due to its higher speed potential). Rear seat occupant's head may touch mast (pole connecting chassis to wing). Pros - Some deliberate friction makes nosewheel steadier than other trike brands. Trailing link suspension system also helps straighten nosewheel. Excellent visibility, and easy taxi maneuvering in tight quarters. Nosewheel brake is helpful even on grass runways, especially so on hard surface; standard equipment, as is a front fender to keep dirt off you during taxi or takeoff. Shock absorbing main gear is standard on Buggy. Cons - Push-left go-right steering, though standard on trikes, still throws 3-axis pilots used to "right way" (push-right go-right) steering. In gusty winds, steadying the wing can tire arm muscles. Braking effectiveness can be decreased when nosewheel is loaded lightly. Pros - Wide-open visibility for all takeoffs or landings. Speeds are remarkably controllable with highly-effective easily-understood trim control. Landing roll is short; better for cross-runway landings. Rotax 582 produces spectacular climb when flown solo, making short- or soft-field operations easier. Carriage is very tough and has generous ground clearance. Cons - Ground roll longer and speeds higher than with some trikes, perhaps due to small size of wing (about 135 square feet of wing area). Trikes don't offer much crosswind control, although this is much less of a problem on the Buggy due to higher wing loading. Pros - Impressive handling achieved thanks to small wing area (though this means you must take extra care not to overload it); pressures were reasonably light, response fairly fast. Nicely balanced handling that is at the same time quite stable. Stops rolling quickly when you're done inputing. Good precision turn characteristics. Adverse yaw virtually not present. Good steep turn management. Cons - Though very good, handling is not as light or quick as the XP Racer model (due to trike mass and closer pilot to wing - wing area is same on both models). Crosswind controls are not as strong as any 3-axis ultralight. Gaining good control by using a smaller wing means pilots must limit the gross loading, or speeds could increase on landing and severe gust loading could threaten structure. Pros - With the Rotax 582, solo flight is breathtaking. Climb is very potent at about 1,500 feet per minute solo. Stall is down in very low 30s. Top speed reached 85 mph in my flying, yet felt solid. Two-seat operations will limit performance, but not much as Buggy remains light at 386 pounds empty. Should be good for cross-country flying. Cons - The 582 is a powerful engine for single-place trike operations; suggests (with higher wing loading) that Buggy is only for accomplished trike pilots. Fuel consumption is fairly high at nearly 3 gallons per hour; 9.9-gallon fuel tank will limit endurance. Sink rate increases due to high loading. Approach speeds are higher, ground roll-out longer. Pros - Comfortable stall characteristics for a higher-loaded wing. Power-on or -off always broke cleanly forward; recovery was very fast. Turns coordinate quite effortlessly; steep turns went well with plenty of "backstick" range. Longitudinal test went perfectly, as did throttle response; both were comfortably positive. Adverse yaw is insignificant. Optional 3-point harness assures security, with belt recoil system for pilot convenience. Cons - Wing loading is higher, which may present some pilots with more abrupt maneuvers than their skill level (refers to high-loaded 2-place flight). Pros - Buggy's sleek design and overall quality may justify the asking price. Handling is very good for a 2-seat (capable) trike. Very established and respected company from southern France; demonstrated commitment to the U.S. market for several years. U.S. dealer support is good; experienced men on each coast. You can change wings if new ones are developed or for different kinds of flying. Cons - Standard Buggy costs about $17,590 fully assembled ($16,990 for 30- to 60-hour assembly kit) - out of many pilots' price range even if it is worth it. Not for novice trike pilots, and trikes aren't for 3-axis pilots who don't have trike training. Higher-loaded flight isn't for everyone (just fly it solo if you're not sure!). Though handling is very good when flown in 2-seat mode, true single-seaters still hold the edge for my taste. Red is the best color for marketing reasons I was told by a Detroit car marketing executive with a half million a year salary. If you’ve seen a Chrysler TV ad recently, you can see they painted all the cars and trucks bright red. Published in Light Sport and Ultralight Flying Seating Single- or 2-seat Empty weight 386 pounds Gross weight 772 pounds Wingspan 30 feet Wing area 135 square feet Wing loading 5.7 pounds/sq ft Wing Trike Height 11 feet 7 inches Fuel Capacity 9.9 gallons Kit type Assembly Build time 30-60 hours Standard engine Rotax 582 Power 65 horsepower Power loading 11.9 pounds/hp Cruise speed 56-74 mph Never exceed speed 87 mph Rate of climb at gross 1,477 fpm Standard Features Twin trike carriage, XP 12 double-surface wing, weight-shift control, hand and foot throttles, steerable nosewheel (push-left, go-right) with brake and mudguard, parking brake, wheel pants, pneumatic suspension, instrument panel, lap seat belt, regulator, water temp, Rotax C gearbox, intake/exhaust silencers, full fairing with windshield, 3-blade composite prop, back seat storage. STRONG CENTER - This center section view of the XP 11 wing (for 11 square meters of wing area) shows the extra stitching and double panels created to bear the large tension load on this wing. Note the refined padding around the wing fold hardware. COZY COCKPIT - The single-seater has a cozy cockpit with shoulder belt, instrument pod, good-supporting foot pedals, and hand throttle in the pod at your right. TRIM LINKAGE - The control bar mounted trim acts to raise or lower the wing's trailing edge via these wires. As you tighten the wheel, the cables are pulled, raising the ribs in their pockets. 503 POWER - Thought by many to be Rotax's finest engine, the 503 gives the XP Racer generous power that makes the Racer live up to its name with ease. RIGHT: BREAK DOWN - Once the wing is removed (it takes just a few minutes), the trike carriage folds down for small trailer transport by removing the upper bolt (with the safety ring). Note the streamlined padding on the mast. UPPER JUNCTURE - At the universal junction of carriage to trike, you can observe the wing-remove bolt (with safety ring) and center of gravity (CG) adjustment, a series of holes aft of the black U-bracket. BOTTOM: TWITT POWER - "Twitt" says, "The Wing Is the Thing," and indeed this is true as the XP is without a doubt the finest trike wing I have ever flown. It handles brilliantly, erasing most of my reservations about trike flying (e.g., stiff handling). SEATING FOR ONE - The Racer is Air Création's trike with seating for one in comfort and style. Without the second seat, the trike sits low and handles more nimbly. GREAT TRIM - This is one effective trim wheel with truly international markings: the turtle means slower and the rabbit means faster. It turns easily and helps readily. More than one European writer has called the single-seat Air Création Racer "the best ultralight in the world." That's a pretty big statement in a world full of wonderful recreational aircraft. Can it measure up? The short answer is, "Yes, very possibly it can!" The best ultralight in the world? Really? Well, this is too sweeping a statement. No one knows which ultralight is truly the best because best is different for every person. What is best for you may not be best for me. This very point has crystallized my response to many pilots who ask me at airshows, "You've flown everything. What should I buy?" I can't answer the question because I don't know what you want. Only after a lengthy conversation and watching you fly could I even hazard a guess about the best ultralight for you. Even then, it's too likely I'd be wrong. Nonetheless, some aircraft are clear winners and others aren't so strong. Compared with all the ultralights I've flown, Air Création's XP Racer is certainly, positively one of the finest I've ever had the pleasure to fly. Is it the very best? The answer depends on who's listening (or reading). However, my tape recorded notes reflect: "Here's a remarkable wing. I almost can't emphasize enough that the single-place Air Création flew terrifically well." So, accept that I believe this is one fine aircraft. Please also remember that I like single-seaters, that I like weight-shift (having flown hang gliders for many years), and that I like very light machines if they do their job well. The XP Racer does. How'd They Do That? The popular TV show "How'd They Do That?" attempts to answer this question. Now it's my turn with the XP Racer trike. In one sense, trikes are like jetliners - they all look very much alike, as the various designers have settled into some standard engineering criteria. Ask a general aviation pilot and, at first, he'll probably be unable to tell one trike from another. Indeed, what Air Création achieved with the XP Racer isn't so much revolutionary as evolutionary. The machine is subtly better than other designs, but it has a few qualities worth highlighting. The wing is small, only 124 square feet. This is one sure way to get better handling response, but the wing obviously has the right shape as well. I emphasize this as the XP 11 wing can also slow down quite well. I saw stall at just 28 mph. Nonetheless, the XP Racer will zip to nearly 95 mph. Since this approaches the 4-to-1 ratio (3.4-to-1 actually) that some designers call their Holy Grail, I must conclude the small wing is highly efficient. Air Création has had years to work this out, going through many wing designs along the way. They stayed at it relentlessly. On their top-of-the-line Clipper, they use a similar wing: the XP 15 with 167 square feet. It flies beautifully but falls well short in handling precision compared to the nimbler XP 11. Company director Gilles Bru also said Air Création sells a 2-place version which uses the smaller wing. Due to a significantly heavier loading, they won't recommend this choice, but the two-up trike does offer some luggage area when flown solo and allows the occasional 2-place flight for more experienced pilots. This shows to me their effort to bring a wing to market that offers better handling than trikes have routinely had. It also shows their concern for their customers. One of the neat aspects of trikes is you can change the wing (within reason) any time you wish. For example, the same Racer trike carriage can fit the single-surface Fun wing. This will produce mellower flight characteristics by sacrificing upper speed range. It also didn't handle as snappy as the XP wing. Especially when contrasted to the Fun, the XP wing is a deeply double-surfaced wing, with a lower surface extending nearly to the trailing edge. Even among racing hang glider wings, this is a large amount of double surface area. On weight-shift devices like trikes, such a design can make for stiff handling. However, a powered trike can have a higher wing loading thanks to the landing gear, so the double surface can be extended. Loading it heavier - and not relying on your legs for gear - improves handling by using more weight to influence wing area. The double surface can now allow brisker speeds. Refinements Aplenty Trikes break down for compact storage and transport. During fold up, parts of the wing and trike are protected by several strategically-located thick leather pads. Just as the trike carriage reveals years of development in this area, so does the wing, with refinements evident everywhere. 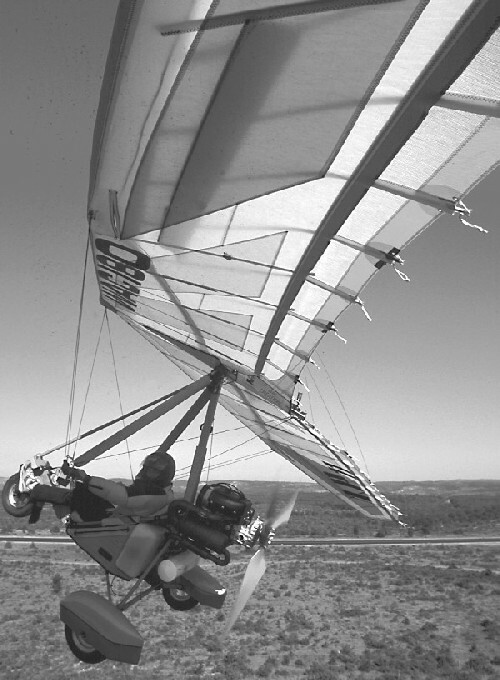 The trim system on the hang glider-type wings that trikes use is a relatively recent arrival. A subtle thing when you watch the trim mechanism from the rear, it doesn't appear to move much. It affects primarily one set of the trailing edge reflex lines, which slightly raises or lowers the trailing edge of the sail. But it works well. The trim performed precisely as Gilles promised, running from about 50 mph to 87 mph, a broad trim range. I can't overstate the trim's usefulness. It was highly effective with surprisingly little control movement that also took little muscular effort. Hidden within a lightweight fabric fairing for the downtubes, a sewn-in plastic window reveals a marker on the activating cable. This shows the position of the trim between two extremes, marked intuitively with a rabbit (faster) or a turtle (slower). These symbols work internationally, and I've seen them on other aircraft. Mounted on the right side, the hand throttle was easy to operate and also marked fairing intuitively with "mini" and "maxi" for less or more power. This hand throttle overrides the foot throttle efficiently, allowing you to launch with the foot throttle - your hands are occupied with control bar duties, especially in stronger conditions - and bring in the hand throttle smoothly when you've gained some altitude. As a long-time "conventional" pilot I prefer fixed-position throttles, but must concede the combination foot/hand device is optimal for trike flying. Foot throttles are actually quite familiar - every car you drive is so fitted. A nosewheel brake was reasonably effective and easily actuated via the left foot pedal. Throttle is on the right foot pedal. The small Racer trike carriage had quite a large fuel tank installed. An optional version, it holds just shy of 10 gallons, which should last about 3 hours. This being a great cross-country flyer, that much fuel is useful. The larger tank pushes the XP Racer out of the Part 103 ultralight category. However, it won't quite make Part 103 weight anyway with the intake and exhaust silencers that make the machine more pleasant to operate. The 52-hp Rotax 503 dual carb with silencers was quieter than most ultralights, although not quite as mute as the 2-place trikes using 6-blade props. Two minor complaints: The throttle on the right foot required me to point my foot a little too far for what is comfortable for me personally, although the hand throttle means you don't need to use the foot throttle for long. And if you push on the pedals unevenly, you'll swivel the nose, making the throttle farther to reach. Eventually you'll develop a technique of using the opposite foot to balance your action. But I won't complain a word about the pedals themselves. In fact, it may seem a small point, but the foot pedals are typically Air Création deluxe, shaped like a foot and very comfortable and secure. The seat was also quite comfortable, better than minimalist trikes. This seat had more padding, although if you are a particularly wide-bottomed person, you simply wouldn't fit in the seat. Speedy trikes are windy, no doubt about it. My nylon jacket ballooned up; leather would be better. And I wish I'd cinched my helmet chin strap down tighter. I couldn't change it in-flight as I'd knotted the loose end to keep from getting beat up by it. The Racer's nosewheel was a trailing-link design. It was also tight enough in its swivel so it stayed in position well. This is better than some trikes which are so slippery they're hard to hold straight. Larger diameter wheels aided the landing and taxiing. Active Condition It was clouded over and occasionally raining lightly the day I tested the XP Racer. I flew in 30 to 40° crosswind conditions blowing 15 to 20 mph. These were valid experiences, and I had no trouble executing four landings. It was easy to keep the XP Racer on track. I've not always found that to be the case on bigger 2-place trikes. Takeoff roll was a little longer than I expected, no doubt due to the small wing. Since trike wings sit high, ground effect may be reduced. So although you must accelerate to a slightly higher flying speed, the small wing performs most enthusiastically once arriving in its preferred speed range. In the hands of a talented factory pilot, the XP Racer performed impressively. All landings went well, flaring easily, with a more than adequate flare window. The blustery day provided some headwind, but clearly the landing characteristics are cooperative. Gilles had promoted the double-surfaced XP wing as possessing very good handling. "It is very nimble," he promised. The XP Racer certainly looked agile as I watched it being flown by others. High aloft, I did precision turns to heading and they came out very close, as good as most 3-axis airplanes. While a few conventional ultralights may be more precise, the difference is slight and this is a major statement of trike handling improvement. I believe if a general aviation pilot were to be suddenly placed in the XP Racer while it flew - assuming he had somehow magically absorbed the basics of trike flying - he would say, "My, this is a delightful flying machine!" If you release the controls in almost any situation (at least, those that I tried), the XP Racer will simply stabilize and fly along straight and true. If you disturb it, it wants to return automatically. I was able to do very steep bank turns in it and they were quite comfortable. Roll reversals were nearly as fast as the better 3-axis machines; only a very few are quicker. Hopefully I've portrayed enthusiasm for the XP Racer's handling characteristics because that's the fact of my experience. The trike was also a lively performer, though. Quite good cross-country potential is available. I was able to cruise at a high rate of speed, about 75 mph. I was able to speed up easily to 87 mph. At this speed, with the control bar pulled right to my chest, the XP Racer tracked amazingly true and straight. It was stable and effortless to sustain, even though I flew in rather rowdy conditions. For tops, I had the XP Racer up close to 94 mph. During these higher speed runs, the trike remained solid and dependable. Though I love to do it in most ultralights, it was too rowdy to fly very low and slow, but I believe she'd have done it well on a prettier day. Stalls pushed out to the front support bar (or close) produced a mild stall break. On some trikes you can't find a break and that's the way the XP Racer was with full power. You have great freedom of movement thanks to optional recoil-type shoulder belts. Stall appeared to be in the neighborhood of the factory-claimed 28 mph. I don't recall observing this with precision, but I found a very slow airspeed at break. At 4.56 pounds per square foot - a medium number in ultralights - this is a fairly slow stall. Of course, dependent as I am on installed instruments, errors are hard to prevent. Is It Your Racer? Let's just say you choose to agree with me that this Air Création XP Racer is a wonderful wing that you'll tremendously enjoy flying (because I truly think you would love it if you tried it). As we flew it, the XP Racer ran about $15,000 in the U.S. Compared to many deluxe single-seat ultralights, this is about average in my view. Naturally, you have ultralight choices that drop to $8,000 or $9,000, but few of those will give you the XP Racer's degree of refinement. And this is built, not a kit! If you're willing to fly with the lower-cost 40-hp Rotax 447 - which should still be plenty powerful - you could own a basic XP Racer for barely over $11,000. At this price, we're getting down into the bargain range. It's the wing that makes the Racer trike fly so well. An XP Racer 503 will enjoy some engine-performance advantages, but not much else. Or if you want the Racer trike but are willing to fly slower with the single-surface Fun wing, the price will drop down below $10,000. And it will also fit within FAR Part 103's definitions. On top of these many choices, you can also elect to receive a kit trike (with the wing built by the factory) and save a few hundred more. Too many selections are offered for me to cover thoroughly, but a call to the U.S. distributors will help clarify your options. Air Création's 2-seaters run about $17,000, much more for the loaded Clipper model. Yet 2-seaters can get as reasonable as $12,000, so import or not, the prices remain roughly competitive with the average American ultralight. Single-seat trikes have been underloved and underregarded, I believe. Try shooting a few touch and goes in a 2-seater with an instructor; it won't take long for an experienced ultralight pilot to pick up the knack. Then go take a hop in one of these Air Création Racers. My bet is you'll be very pleasantly surprised. Standard Features Rotax 503 dual carb engine, 2.58-to-1 B gearbox, 2-blade wood propeller, steerable nosewheel (push left, go right), nosewheel brake, nosewheel mud flap, dual hand/foot throttles, nonslip control bar grips, double side cables, composite landing gear legs, removable foam seat, storage pocket. Options noise reduction system, 9.9-gallon fuel tank, trim system, instrument console, instruments (tach, ASI, alt, vario, compass, CHT, EGT, AC/DC regulator, hourmeter), ballistic parachute, wheel pants, side saddle bags, 3-point pilot restraint, strobe light, comm radios, helmets, other engines and trike wings, trike trailer. Construction Aluminum tubing, fiberglass, Trilam and Mylar sailcloth. Pros - Well-developed single-seat trike earns reviews calling it one of the world's best ultralights. Based on years of similar designs, Racer trike carriage is simple yet refined. Members of the Air Création family have earned certification; built by same production process. Powerful, quiet, speedy, all with the best trike handling I've experienced. Cons - Some pilots pass on weight-shift controlled trikes (though this may be due to ignorance) and others want 2-place (though they may fly solo all the time) - too bad they feel this way, perhaps, but many do. Looks simple with lots of exposed tubing. Overall though, this design is extremely hard to fault in any way. Pros - Wonderful trim system; as good as any 3-axis aerodynamic trim (which on a weight-shift design is tougher to do). Nosewheel brake surprisingly effective - loading on gear is more even than some. Large fuel tank, easily refilled without spillage, and quantity viewable in flight (with some twisting in your seat). Dual hand and foot throttles. Cons - Pull starting the 503 while seated is somewhat physically challenging. Brake is nondifferential (though hardly needed). Great optional trim system is pricey at $445. No flaps available. Optional fuel tank too large for Part 103 operations. Pros - Very comfortable seat with (optional) retractable shoulder belt system. Foot-shaped pedals are secure and comfortable. Dual foot/hand throttles are excellent; hand throttle overrides foot for in-flight ease. Optional side bags ($260) are worth it, as little other space available for carry-along gear. Easily read gauges. Easy entry and exit. Cons - Lap belts are insufficient on any aircraft; order Air Création's slick $260 optional system. No matter its state of refinement, all trikes are still windy at speed. Any enclosure clutters this type of design, so get a full-face helmet. Pros - Nosewheel has some swivel friction to help steady the nosewheel. Trailing-link system also helps. Excellent visibility, especially by lifting a wing as needed, which further helps taxiing in tight quarters. Tight turning possible. Standard nosewheel brake will help on most surfaces and in most situations. Cons - Still "wrong way" steering (push left, go right); standard on trikes, maybe, but still thought to be awkward to 3-axis pilots. You must steady wing movements with arm muscles; can be difficult in gusty winds. Suspension is air in the tires, though this appears more than enough on the light trike. Braking effectiveness can be decreased if nosewheel loaded lightly. Pros - Excellent takeoff or landing visibility. Speeds controllable through highly effective trim. Landing roll is short, making slight cross-runway landings okay. Vigorous climb over 1,000 fpm is satisfying. Both items help on short or soft fields. Carriage is stout enough to handle rough fields. Good ground clearance also helps. Cons - Ground roll longer than expected perhaps due to small size of wing (only 124 square feet). Trikes don't offer much crosswind controls, although this didn't trouble the XP Racer much. Don't land with trim on "fast" - your push-out is harder. Slips also aren't much help on weight-shift trikes. Adding floats presents a whole new challenge (must add water rudders). Pros - Wow, am I impressed! Short of hang glider wings on superlight trikes, this is the best handling trike I've ever flown - even 3-axis pilots would have to be impressed if they tried it. Precision turns to heading were comparable to 3-axis aircraft. Adverse yaw virtually not present (hint: you push out a little to coordinate turn). Control pressures were light. Response was fast and predictable. Good steep turn management. Cons - Crosswind controls are not as strong as 3-axis (though overall controls are so good this isn't a problem except on very gusty days). No other negatives. Pros - Excellent speed range, easily discovered as handling is superior and the trim works so well. Stall is in high 20s. Max speed flown was nearly 95; both extremes felt entirely secure. Climb is very potent; factory claim of more than 1,300 fpm is believable. With silencers, Racer 503 remains very quiet (a claimed 68 decibels at full power at 500 feet - the loudness of ordinary conversation!). Cross-country flying is one the XP Racer's strong suits. 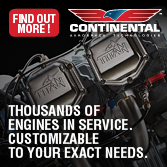 Cons - The 503 is a big engine on a small, light trike. Fuel consumption is understandably 2.5 gph; with Part 103 tank of 5 gallons, you'll have barely 2 hours endurance. Sink rate shows this is no hang glider, but then, it wasn't designed to be one. Pros - Excellent stall characteristics; power-on versions never faltered. Power-off stalls broke but straight and without evil tendencies. Turns coordinate quite well; steep turns went well with plenty of "back range" (means more push-out). Longitudinal test went perfectly as did throttle response; both were comfortably positive. Adverse yaw is minimal even without trying to offset with controls. Pros - An XP Racer fitted like the test aircraft will run about $15,000. For a single-seater, this might seem pricey, but this is ready-to-fly and one dandy flying machine. The controls are the best I've found on any non-hang glider trike. 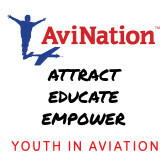 Air Création is one of the world's most established and respected. French company has demonstrated commitment to the U.S. market. U.S. dealer support has remained dependable even while manufacturer changed representatives. You can change wings if new ones are developed (try that with your 3-axis machine!). Cons - Some common concerns of ultralight buyers are erased by the ready-to-fly construction (e.g., manual quality, tech support), however, you still must consider that this is a weight-shift, single-place aircraft which will make resale harder. More than one European writer has called the single-seat Air Création Racer “the best ultralight in the world.” That’s a pretty big statement in a world full of wonderful recreational aircraft. Can it measure up? The short answer is, “Yes, very possibly it can!” The best ultralight in the world? Really? Well, this is too sweeping a statement. No one knows which ultralight is truly the best because best is different for every person. What is best for you may not be best for me. This very point has crystallized my response to many pilots who ask me at airshows, “You’ve flown everything. What should I buy?” I can’t answer the question because I don’t know what you want. Only after a lengthy conversation and watching you fly could I even hazard a guess about the best ultralight for you. Even then, it’s too likely I’d be wrong. Nonetheless, some aircraft are clear winners and others aren’t so strong.